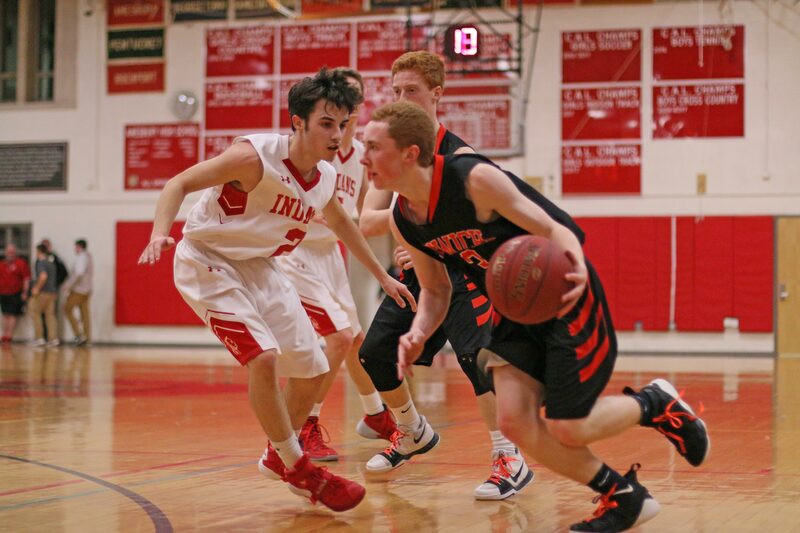 (Byfield MA) You knew it wasn’t Triton’s day when the best chance they had all game never happened. The Vikings were awarded a direct kick from close to the right sidelines in the closing minute. Everyone moved in close to the goal, including the entire Ipswich team. 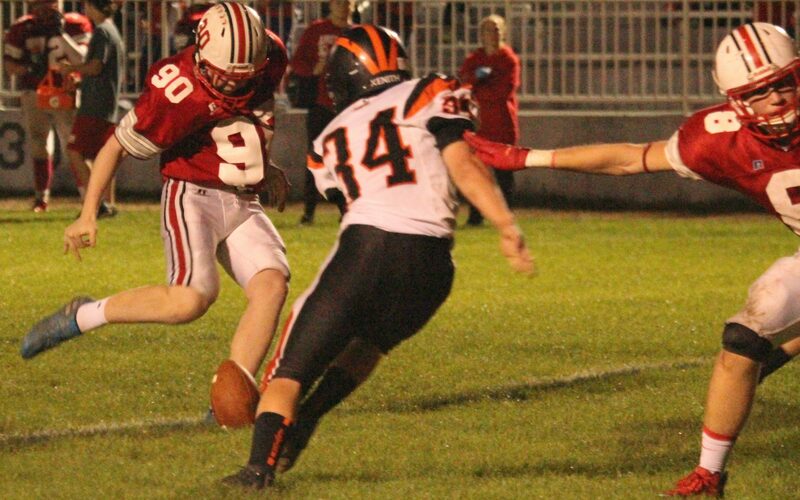 The kick was about to be taken when the whistle sounded ending the game. 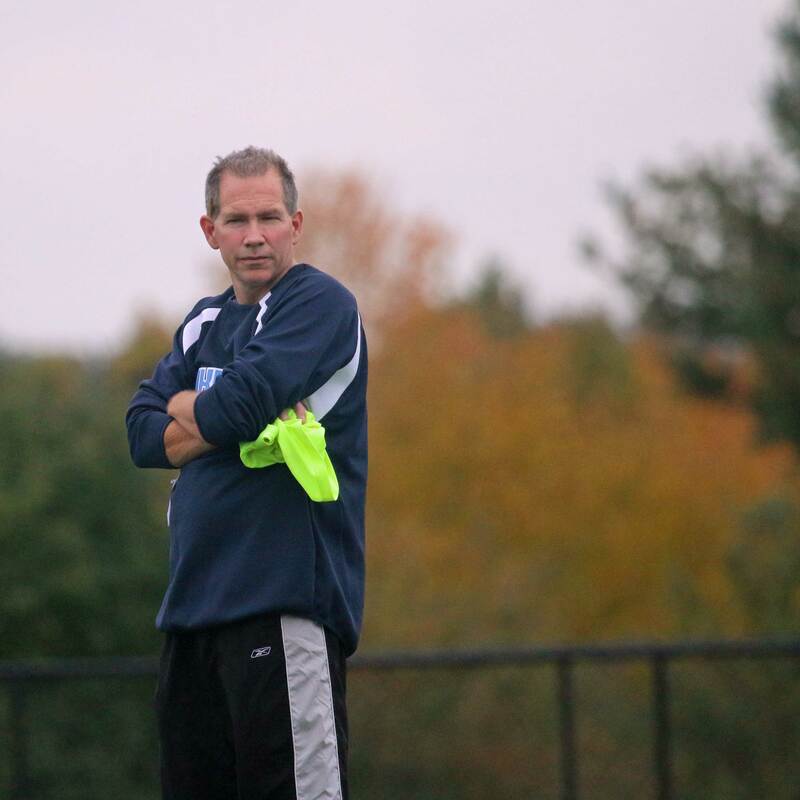 “They had that great opportunity at the end,” said a relieved Ipswich coach Greg Scruton afterwards. 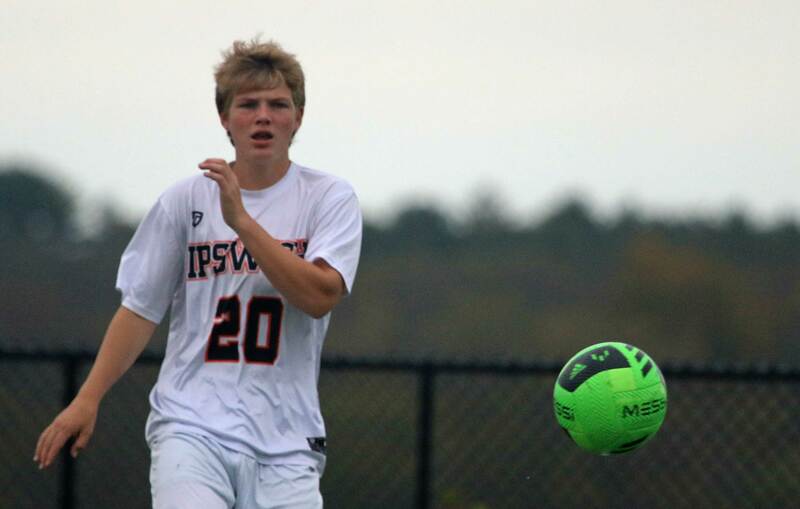 The Tigers were winners 1-0 in Cape Ann League boys soccer on an overcast Monday afternoon. Rain was predicted but never happened. 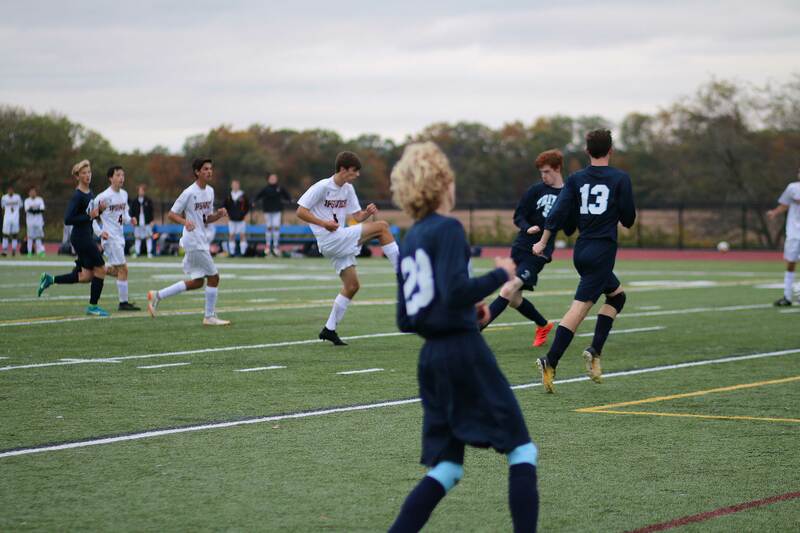 Ipswich (3-8-2) had chances galore throughout this one but the combination of misfires and the goalkeeping of Mark Anthony Glickman frustrated the visitors. 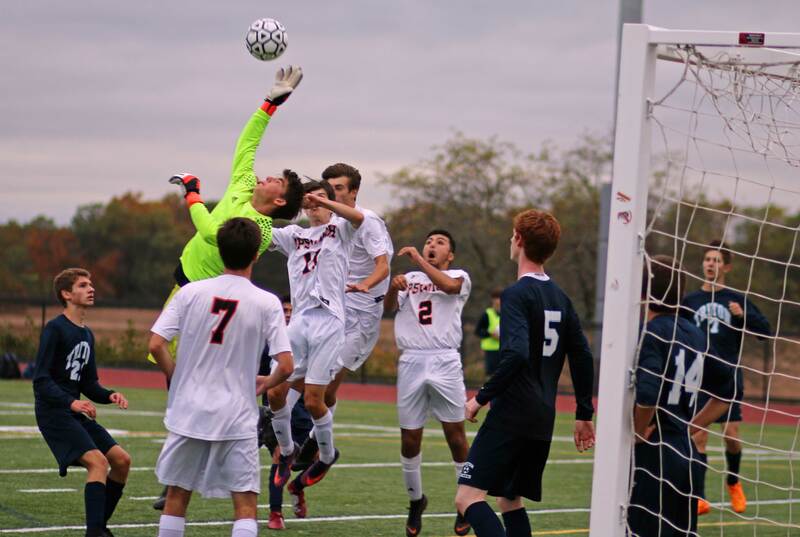 The Tigers broke the scoreless tie eighteen minutes into the second half. 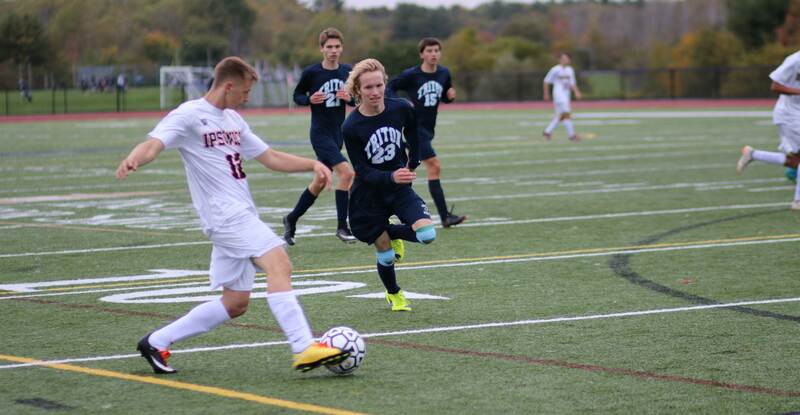 Chase Gagnon sets up the only Ipswich goal. 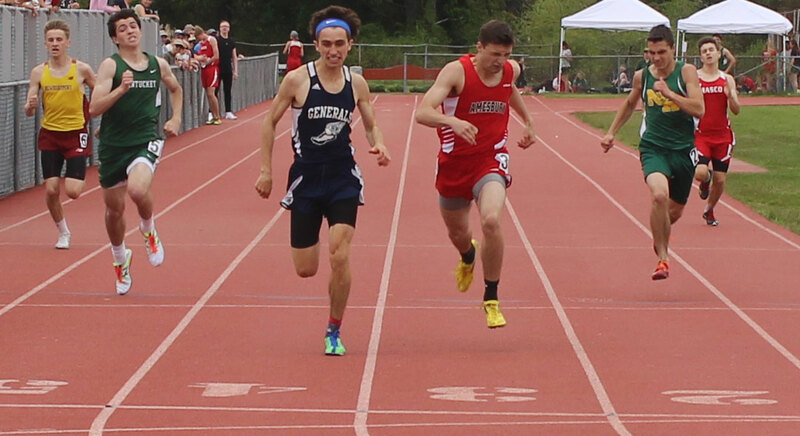 Senior Chase Gagnon set Justin up. Chase broke down the right side and put the ball back into the middle where Justin was wide open to receive the pass. The loss was a tough one for the Vikings (1-11-1) especially the way it ended with them missing out on the best chance they had all day. 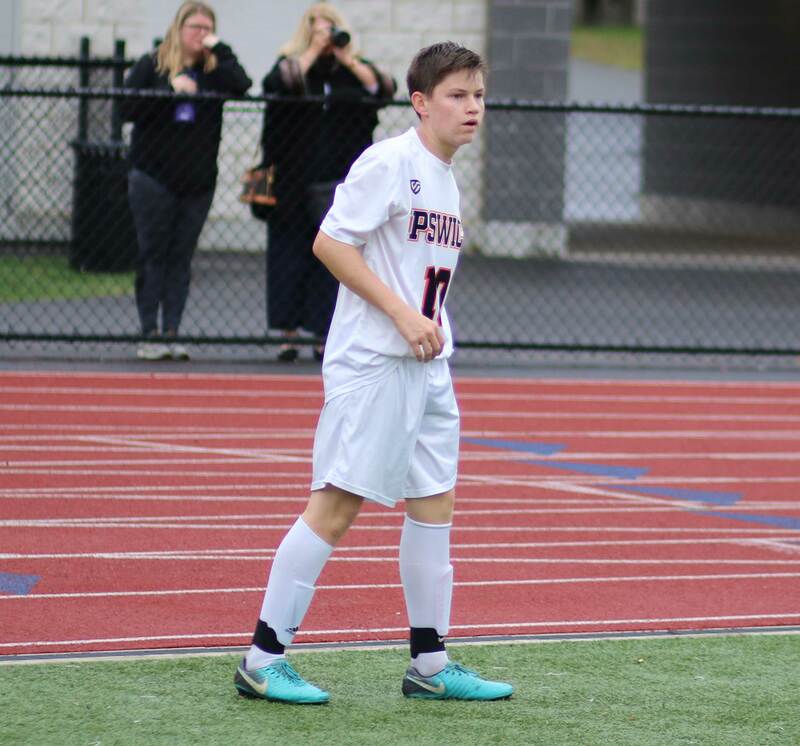 Both coaches marveled at a second-half sequence in which sophomore defender Brendan Dennis refused to allow Ipswich a second goal. 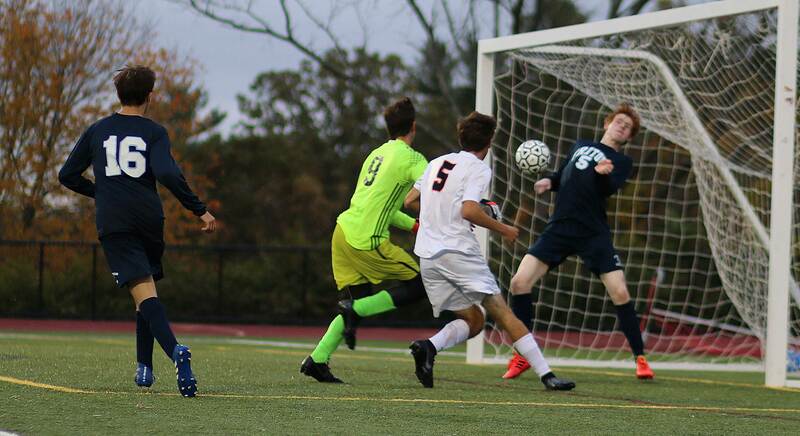 Justin Foye put a shot over junior goalie Mark Anthony Glickman that was heading for the net. 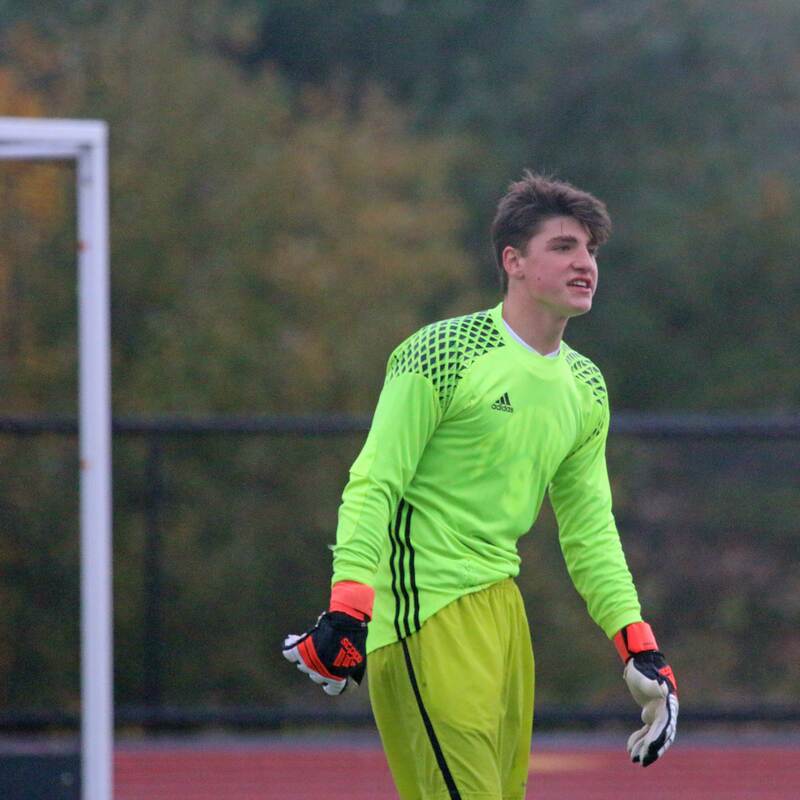 Brendan kept that out and then blocked two other shots to deny the Tigers. 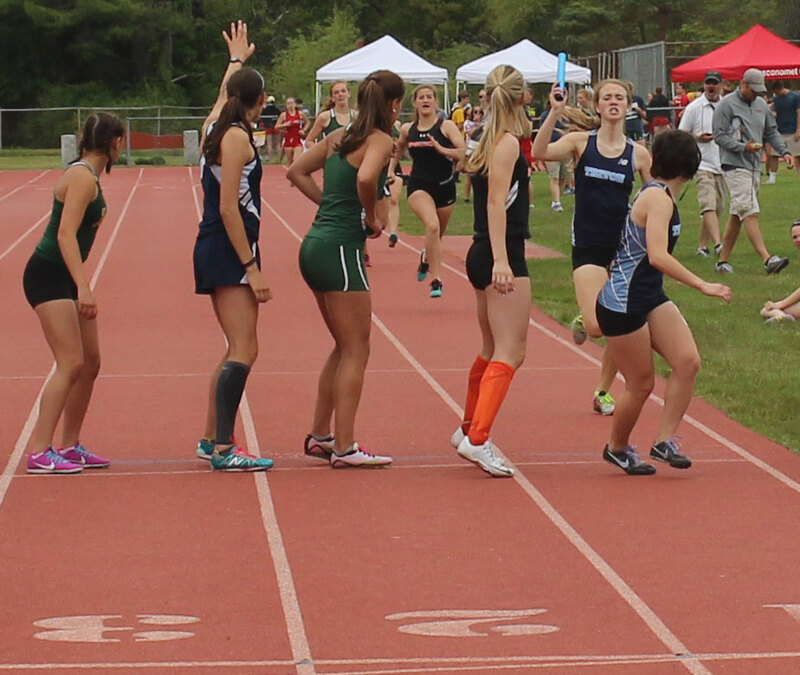 The Vikings hustled and encouraged each other throughout the game. 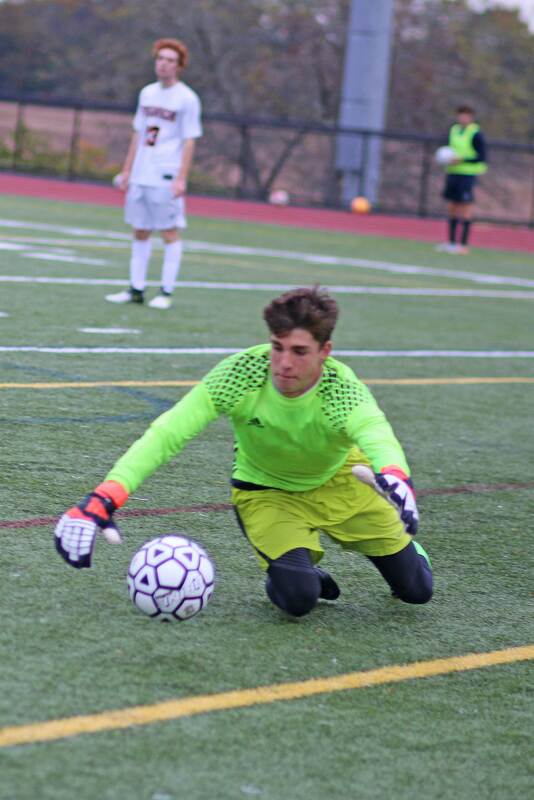 One thing there were plenty of in this game were corner kicks. 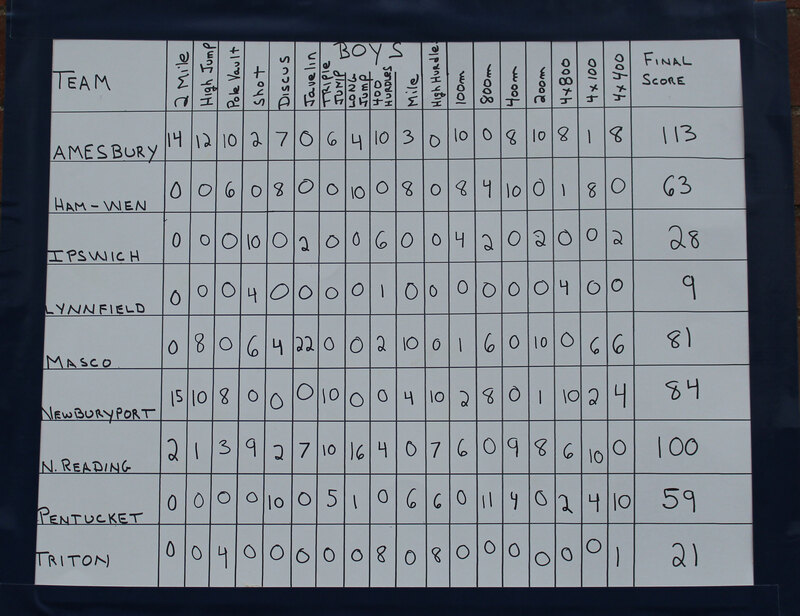 All of them were by Ipswich and they were all taken by Jake Scruton. 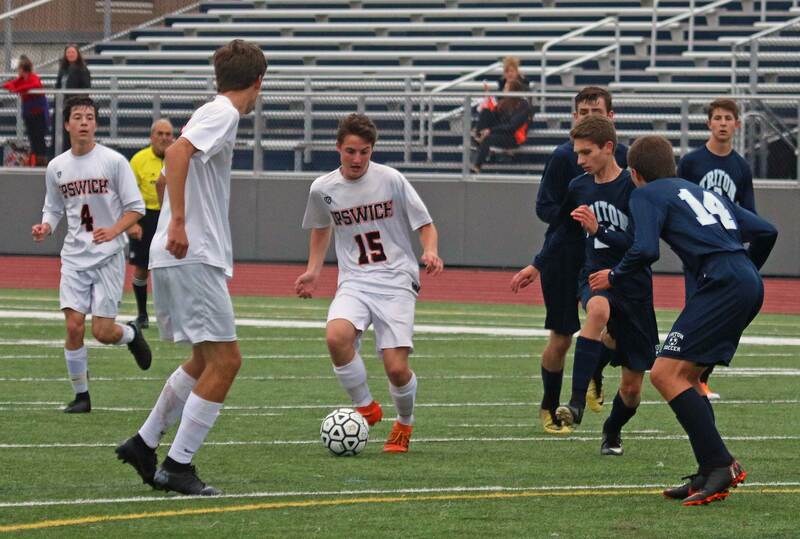 The Ipswich sophomore had the skill to put the ball right where teammates were in the middle of the box. 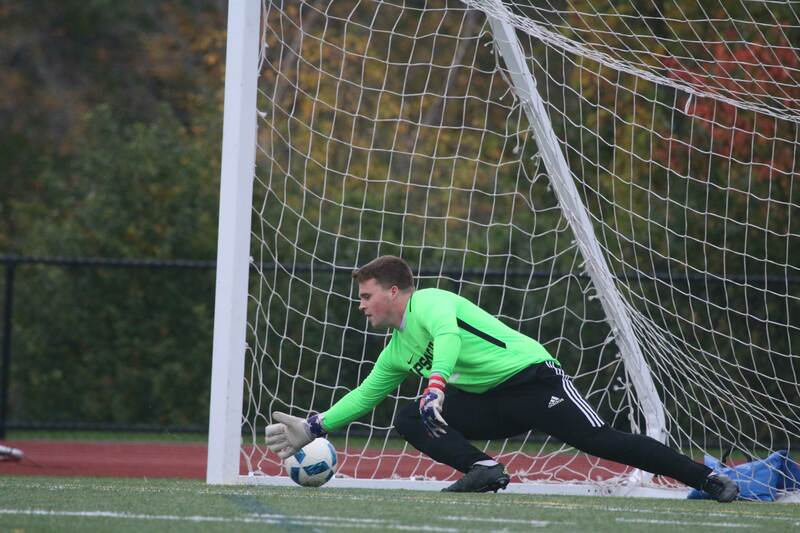 GK Mark Anthony Glickman somehow managed to keep those Ipswich chances out of the net. I like the turf field at Triton. It is fast with true bounces. 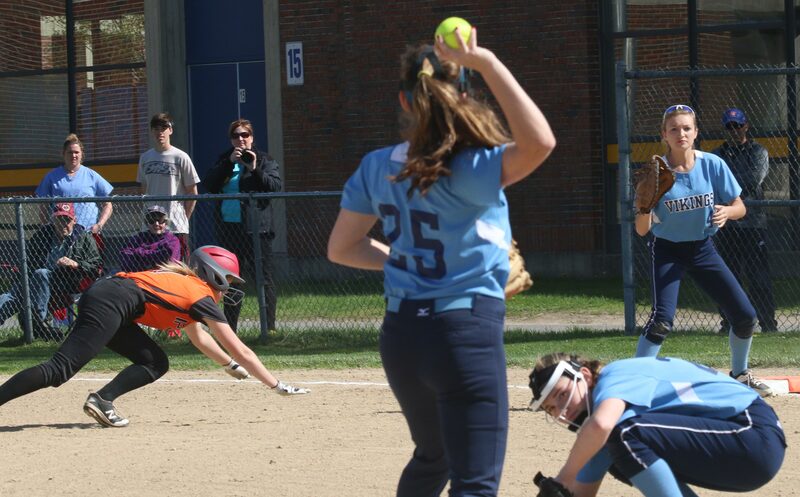 (Byfield MA) Triton (12-1) won their ninth straight game this afternoon but it was anything but easy. 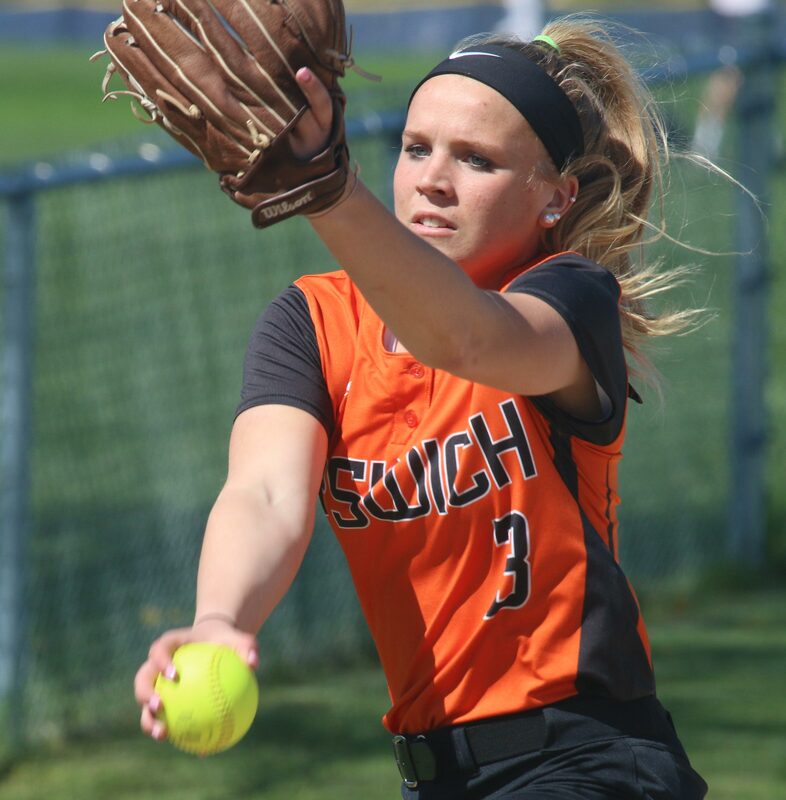 The Ipswich Tigers (6-7) had the pitching and hitting to give the Vikings quite a battle before falling, 6-5, on Friday in Cape Ann League action. Defense separated the two teams. 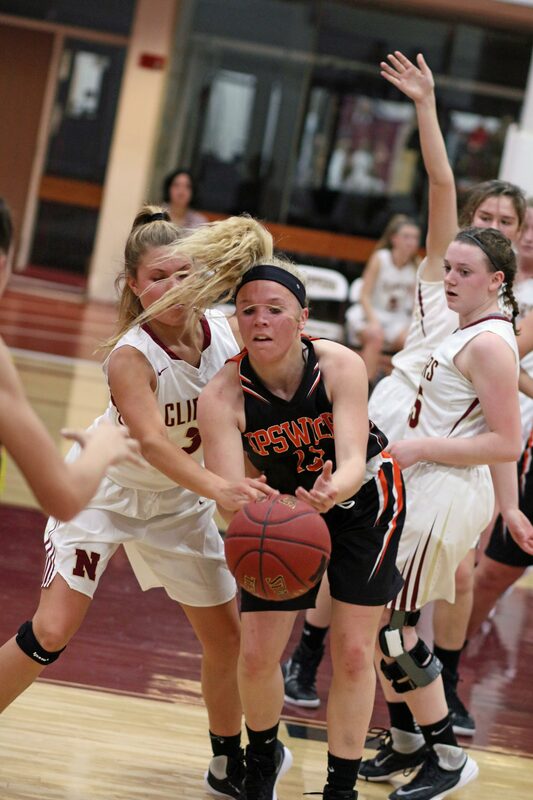 The Vikings played flawless defense while the Tigers allowed three unearned runs. 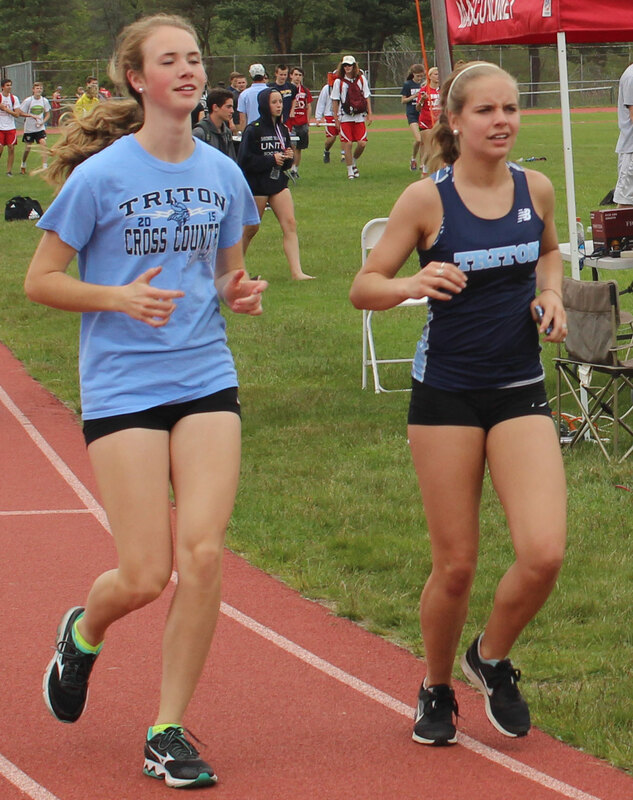 “If we don’t hit, we have to be perfect in the field,” explained Triton senior Taylor Penniman afterwards. 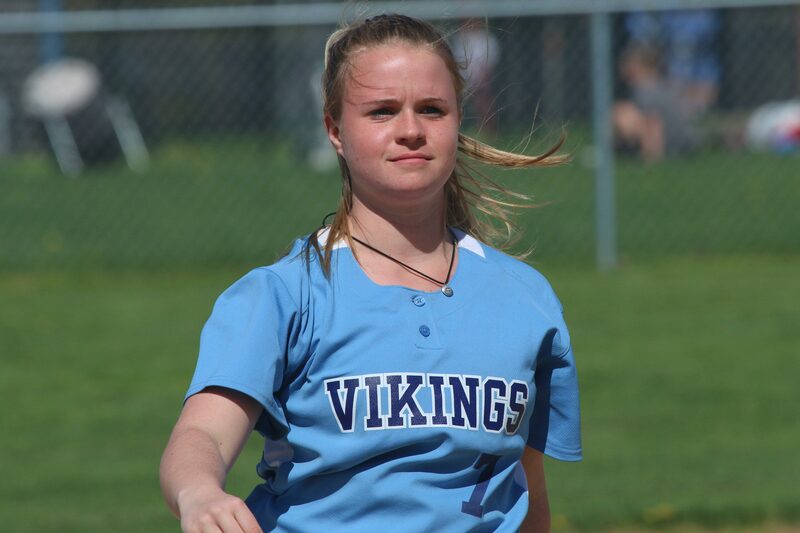 The Vikings had been averaging over eleven runs per game but today they ran into junior Katherine Noftall. Katherine allowed three earned runs and had six strikeouts. 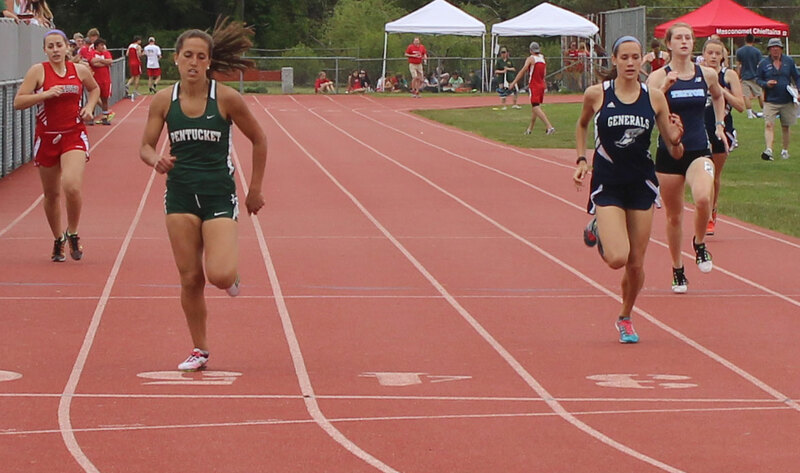 Equally impressive was the hitting of Katherine and her sister Erika. Katherine was a triple short of the cycle while Erika had two singles and a double. Katherine’s two-run homer over the right field fence in the top of the 7th brought the visitors to within a run with one out. 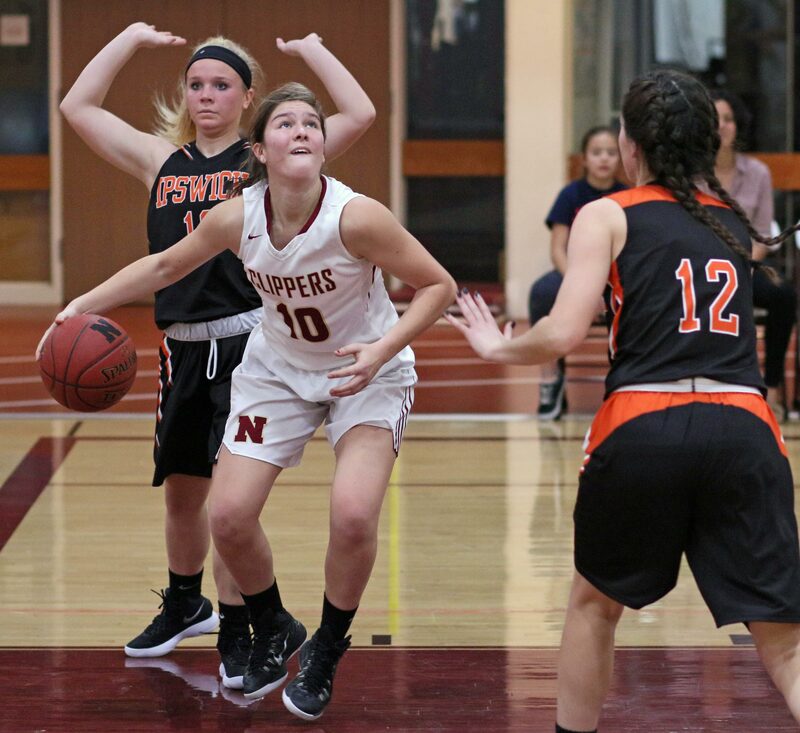 “It was a nail biter for sure,” recalled Triton coach Dave Dupere. 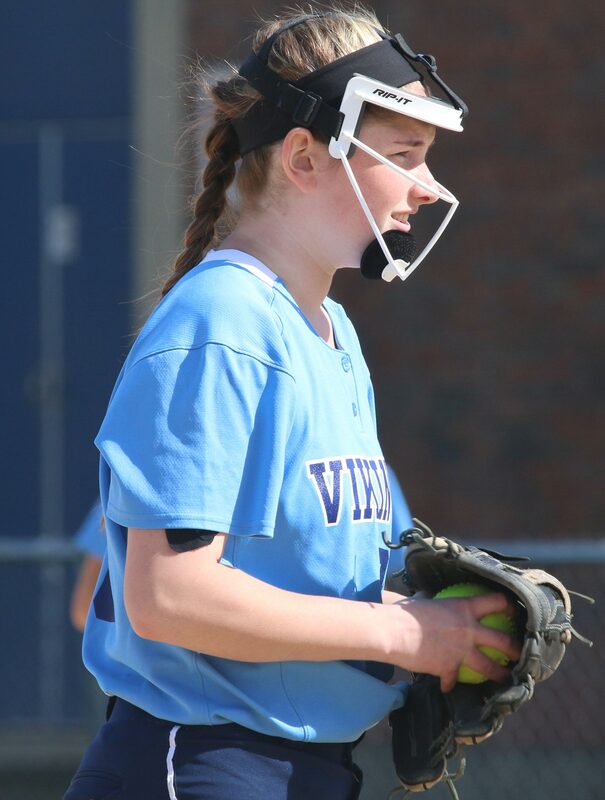 Pitcher Katherine Quigley, however, ended any further damage with a strikeout (Mya Cuevas) and a ground out (Rowan Galanis). The streaking Vikings had single runs in the second, third, and fourth. Their game-deciding runs came in a three-run fifth. 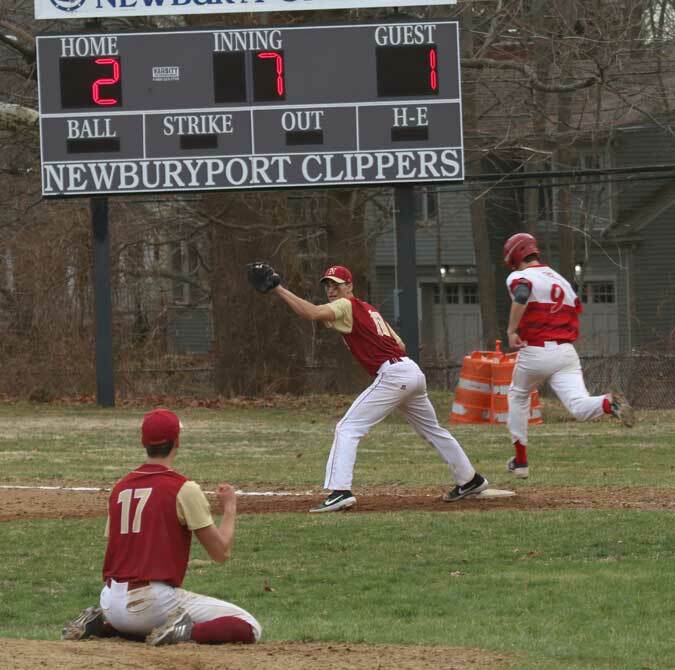 “That fifth inning was where one run turned into three and it cost us,” said Ipswich coach Brian Seabury. 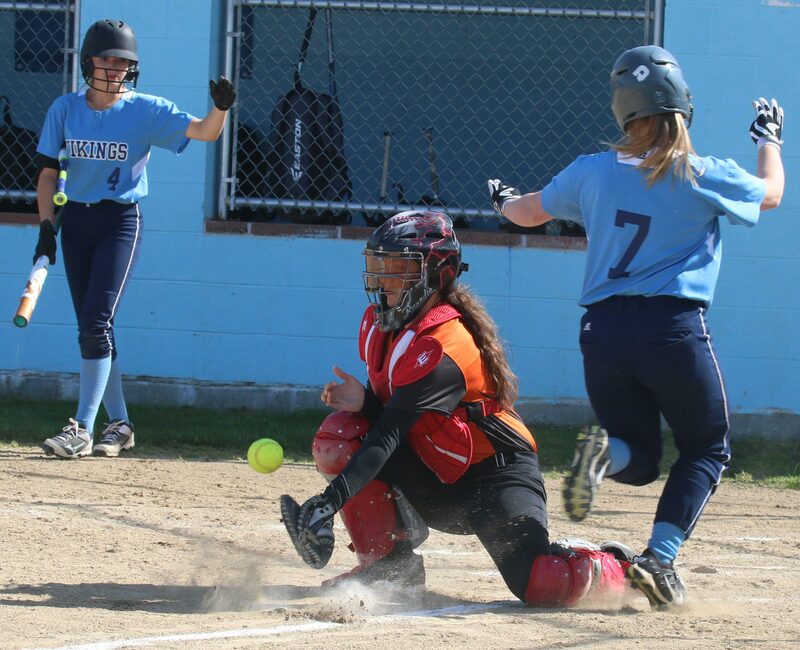 Triton scored a run in the second when Carisa Boyle drove in Eve Paicos with a double to left. 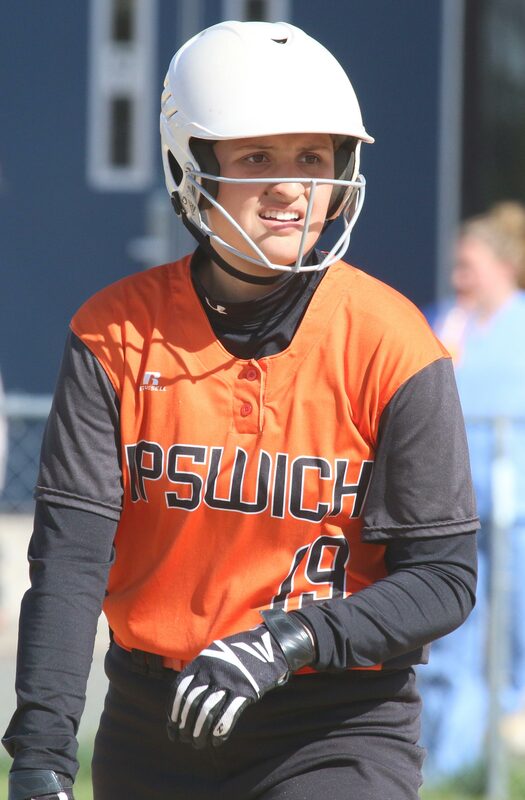 In the Ipswich third, junior Katherine Noftall drove in sophomore Erika Noftall with a single to center. 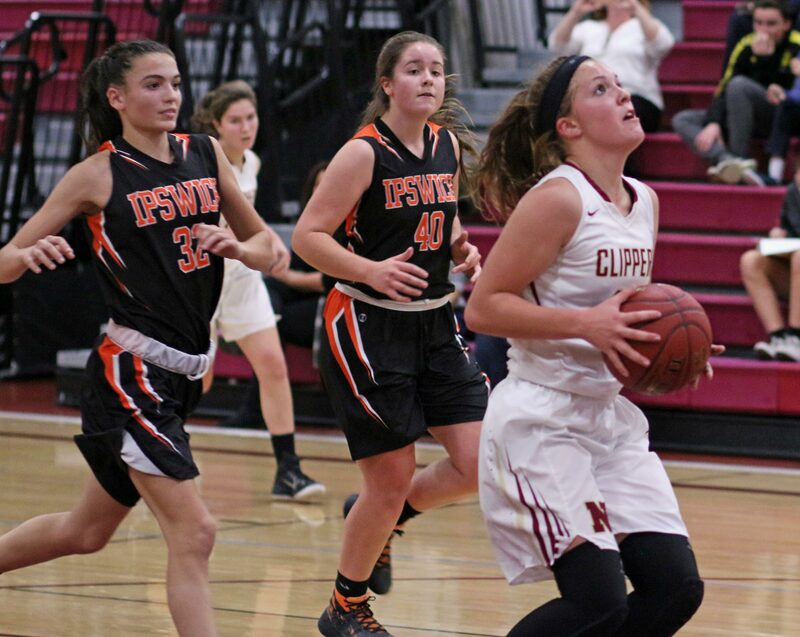 Later it was sophomore Mya Cuevas singling Katherine home. In the Triton 3rd, a Grace McGonagle double was followed by a Bridget Sheehan RBI single to right. The Vikings pulled in front, 3-2 in the fourth. 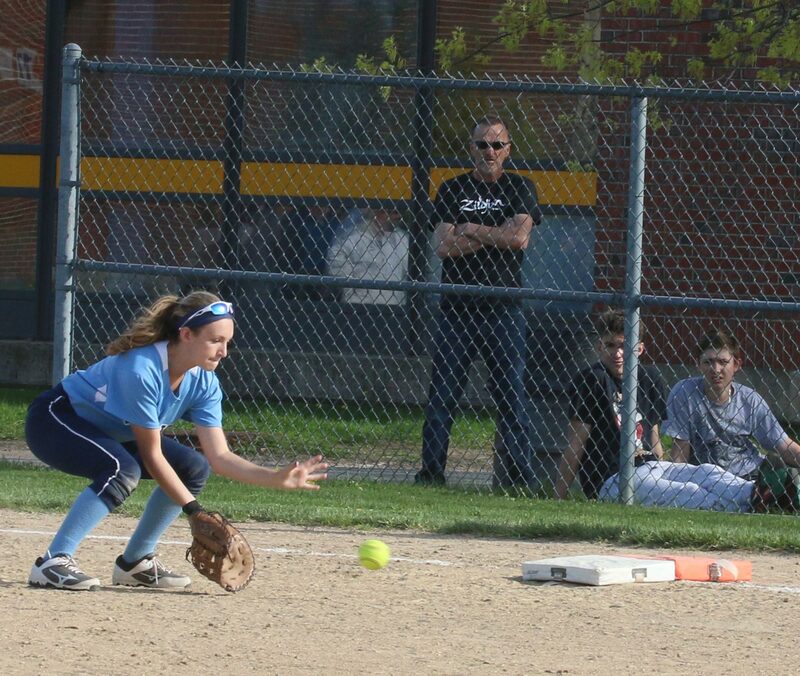 An infield bobble (2B Rowan Galanis) enabled Collen McCarthy to reach. Colleen later scored on a sacrifice fly by Eve Paicos. 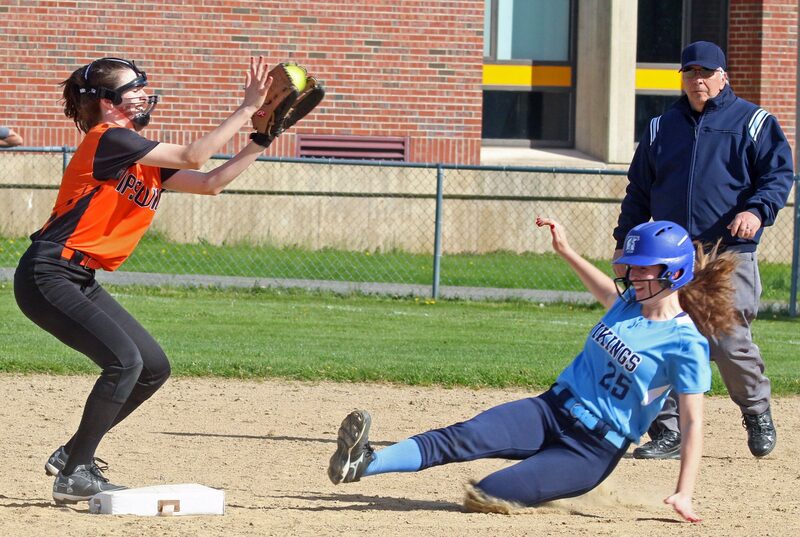 3B Colleen McCarthy started the Tigers 5th with a defensive gem stabbing Cat Seaman’s liner. 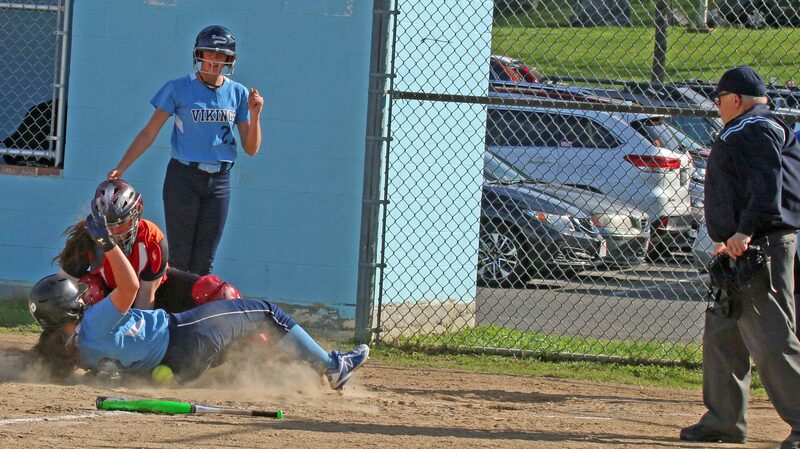 But Katherine Noftall followed with a double to CF and Mya Cuevas recorded her second RBI with a single. 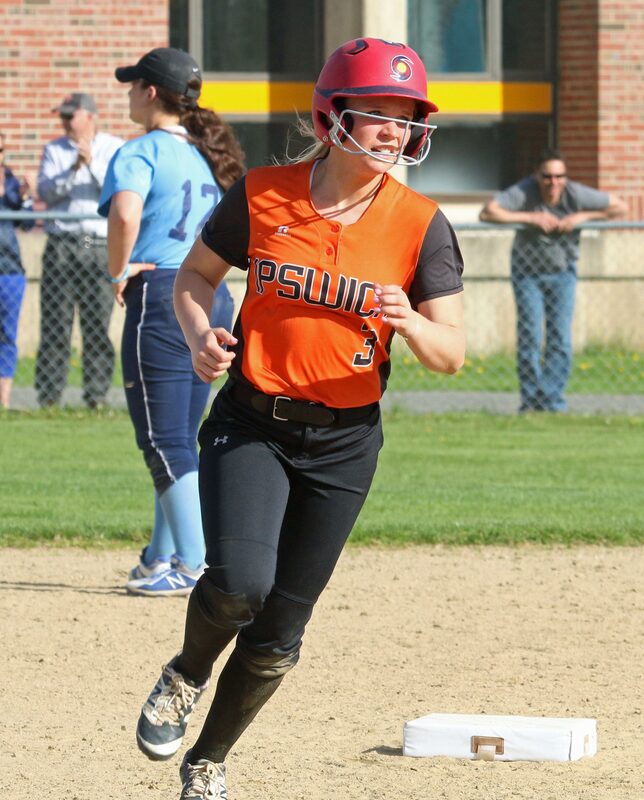 Erika Noftall reached base (single) before her sister took Katherine Quigley deep in the Ipswich 7th. 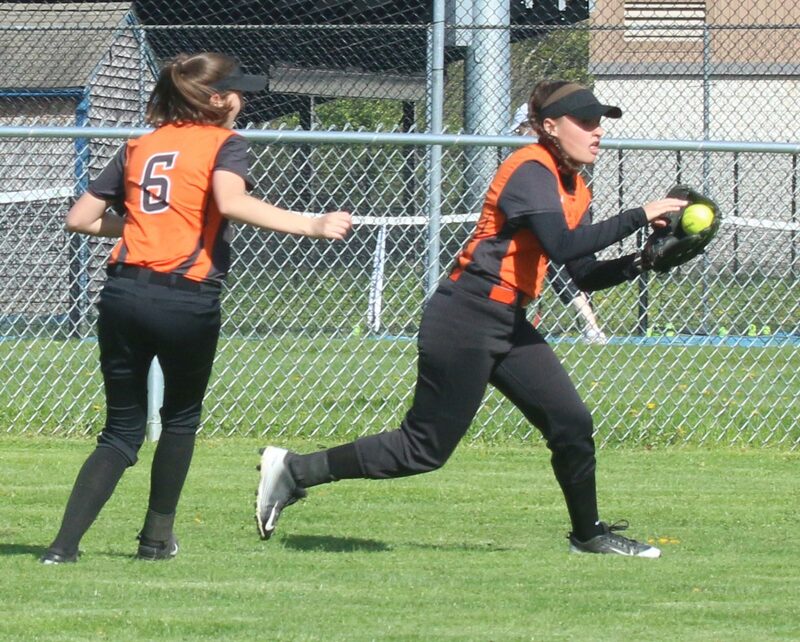 Tigers’ left fielder (Mya Cuevas) and center fielder (Cat Seaman) worked together in Triton 4th. Cat looked as if she had a catch lined up in a tough sun with Mya nearby. 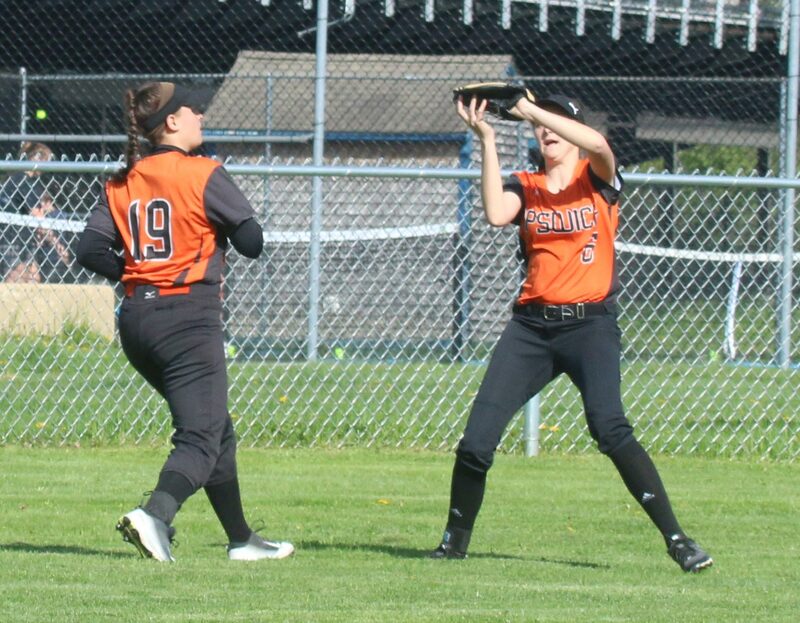 At the last second the ball bounced off Cat’s glove and nearby Mya was able to snag the rebound! Ipswich had no luck when it came to strategy. 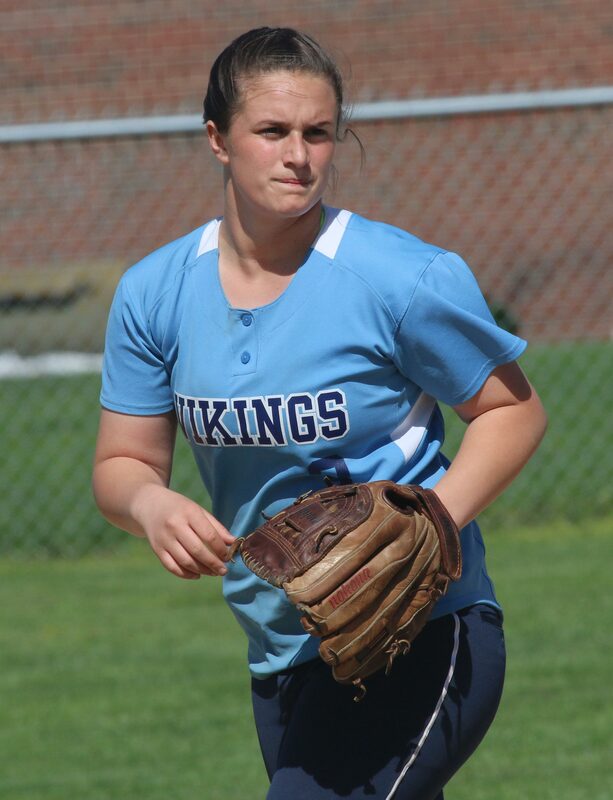 In the Triton 3rd, Coach Seabury wanted to walk Bridget Sheehan (CAL All-Star) but pitcher Katherine Noftall had struck out Bridget in the first. So they pitched to Bridget and she had an RBI single. 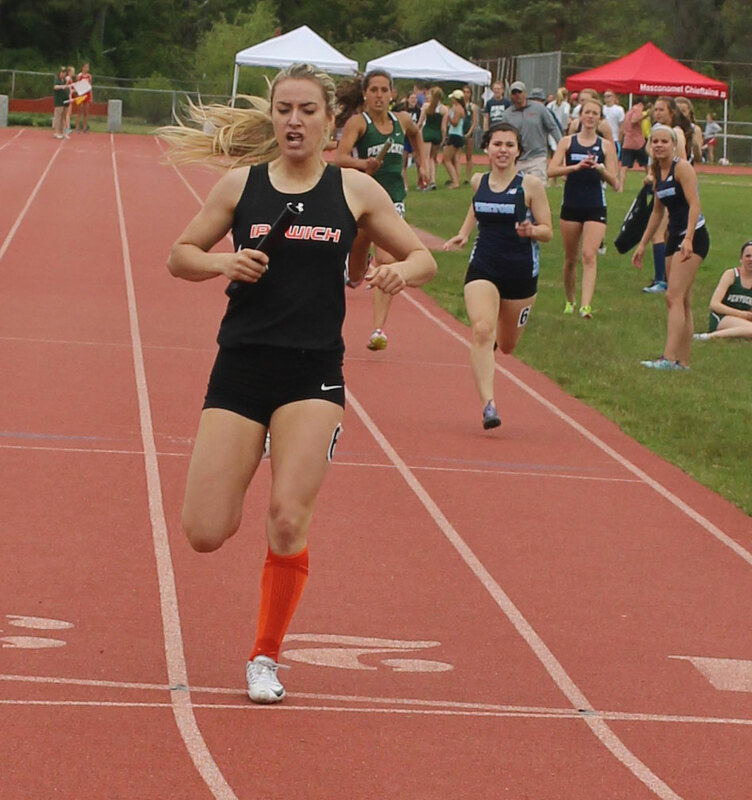 In the fatal fifth, Bridget came up again and it was decided to walk her this time and face Emily Karvielis instead. Emily hit an RBI single that ended up scoring three runs. 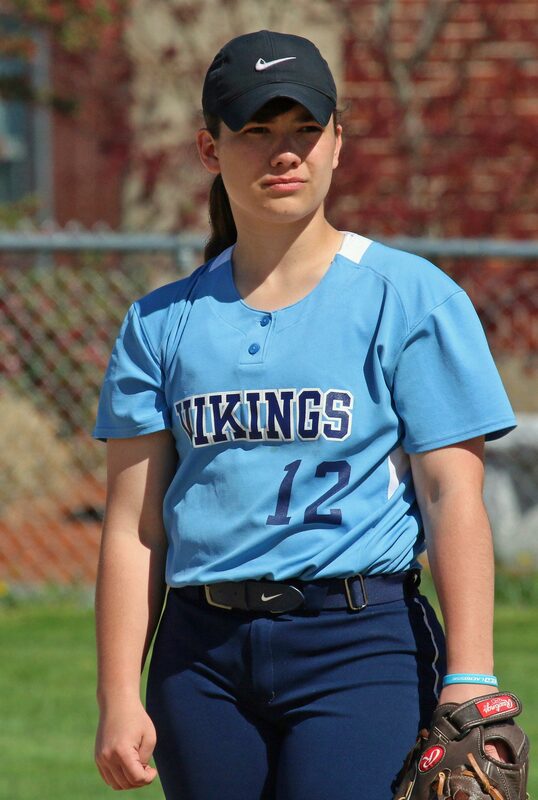 “Katherine (Noftall) usually pitches against the large teams,” said Coach Seabury. Sister Erika pitches the other ones. 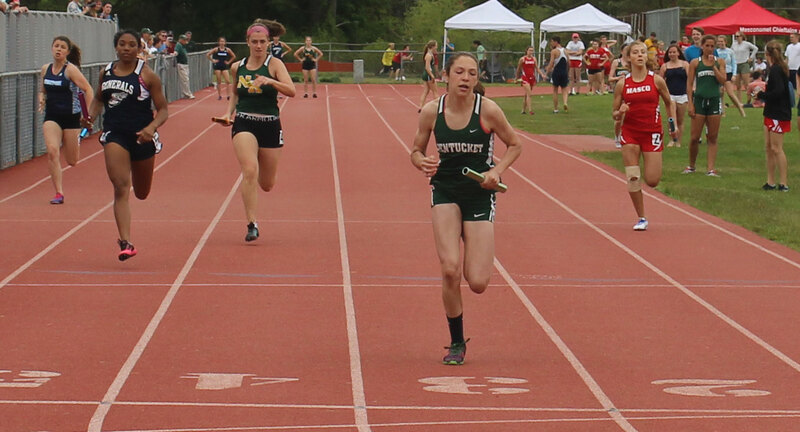 Sophomore Katherine Quigley registered her 11th win. She struck out eight and walked one. 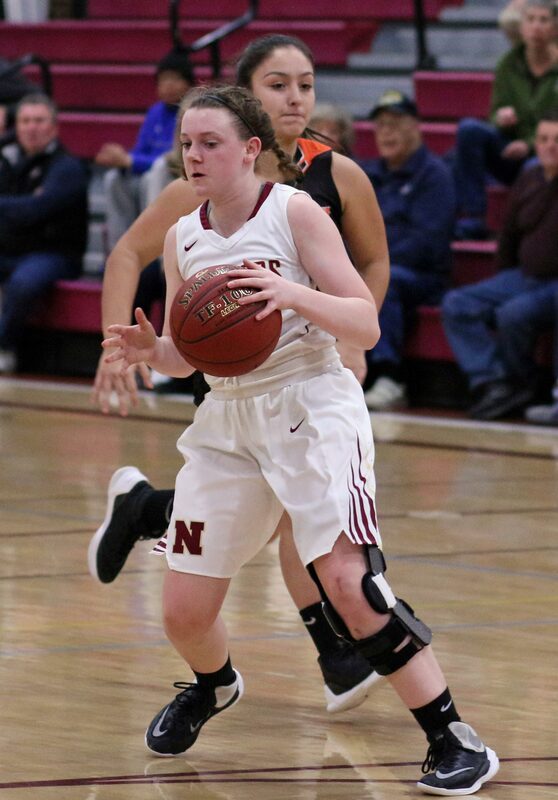 Taylor Penniman told me that in the fall she will be going to Mass Art in Boston to study graphic design and advertising. Katherine Noftall also scored three runs for Ipswich. 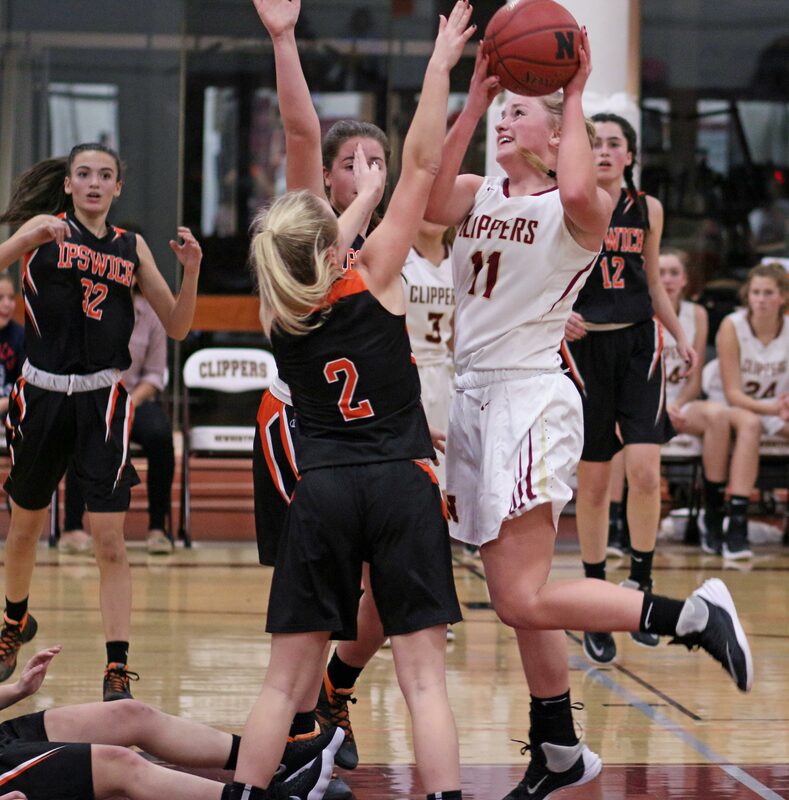 I saw her drop twenty-five points on Newburyport, including three 3’s, during the basketball season. 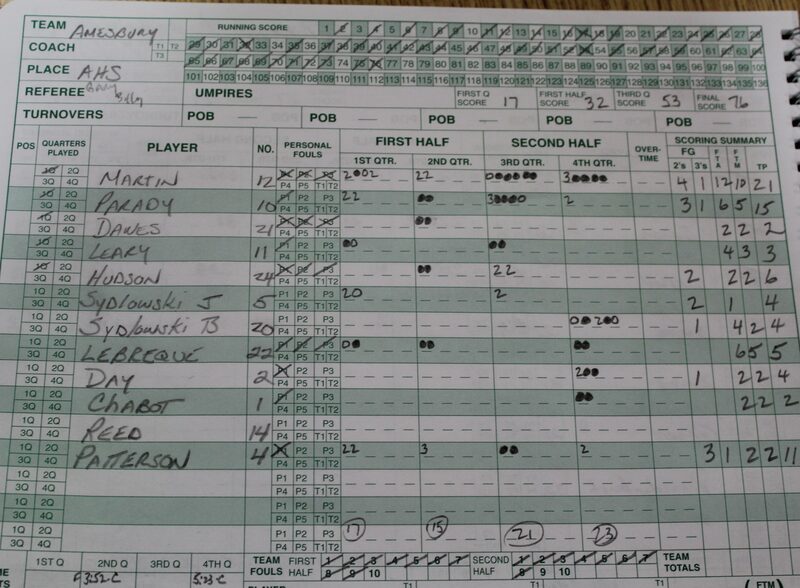 (Amesbury MA) One team had trouble making shots while the other team had trouble with turnovers. 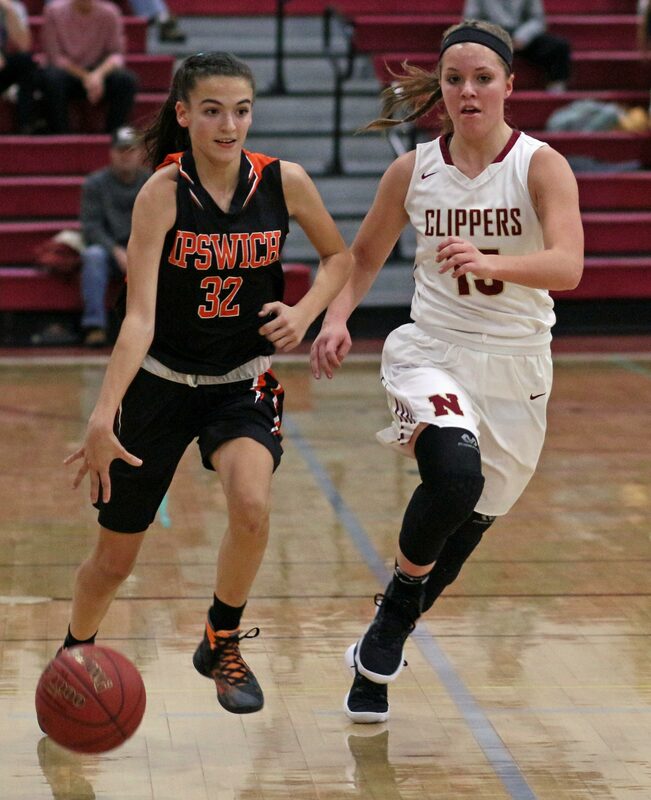 In overtime, it was Ipswich that made a big shot (Izzy Morrissey) to give the Tigers an exciting, 74-69, win over Amesbury on Thursday night. 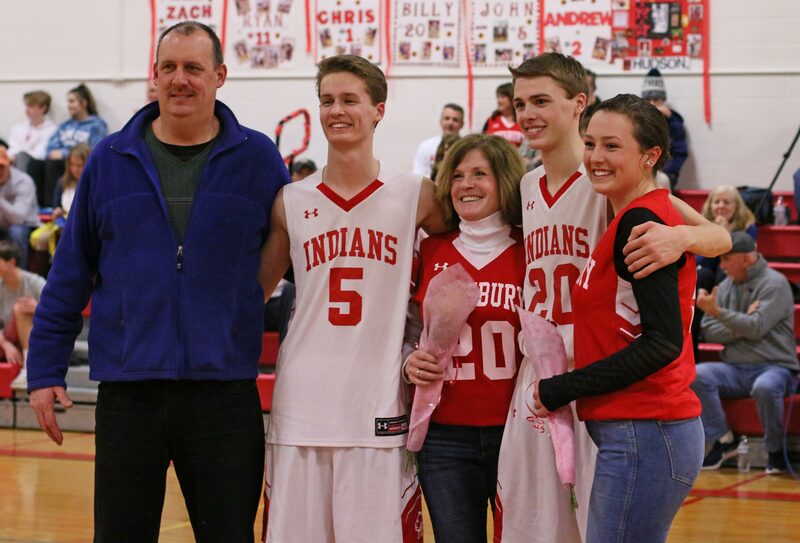 The Indians (7-11) honored their seniors pregame and there were 3rd & 4th graders playing at halftime. That brought out an enthusiastic crowd and there was plenty for them to get revved up about. 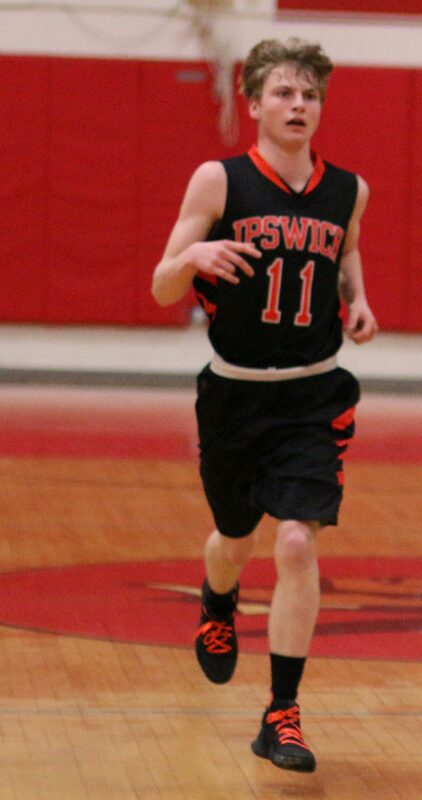 Ipswich (6-15) had W’s over Rockport (twice) and Georgetown (once) in the Cape Ann League before tonight’s victory. 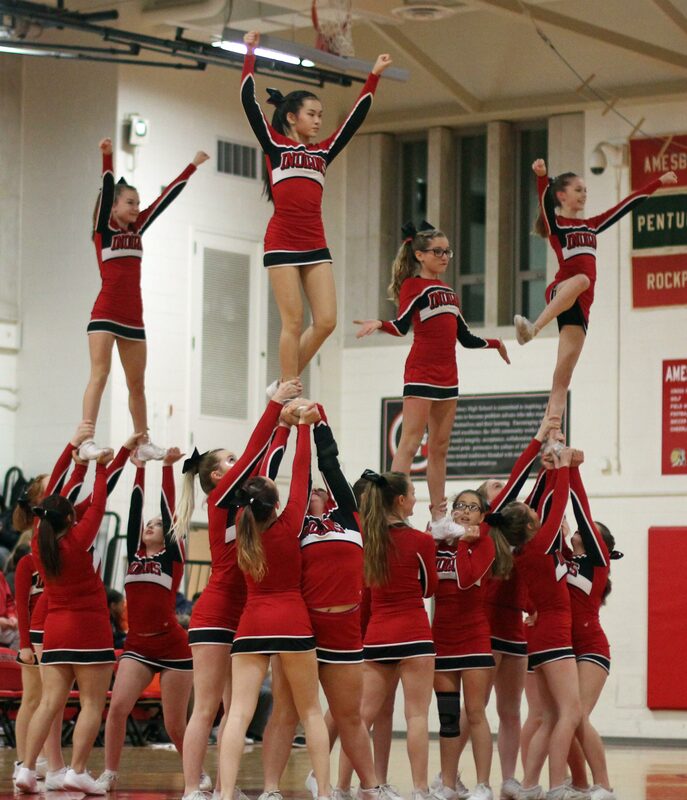 I saw Amesbury in their home opener against Hamilton-Wenham. 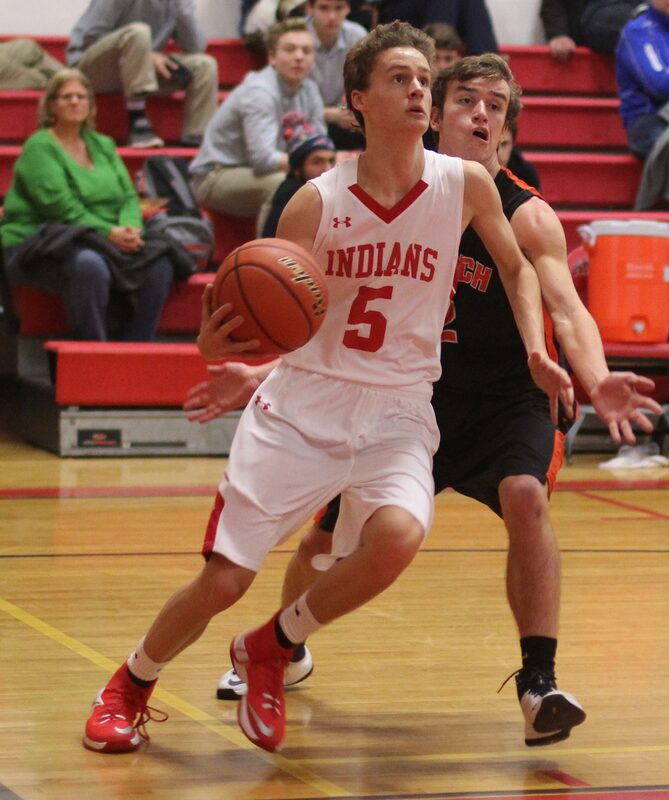 The Indians lost only by three points in that one despite thirty turnovers. Tonight’s loss had a similar flavor for the home team. 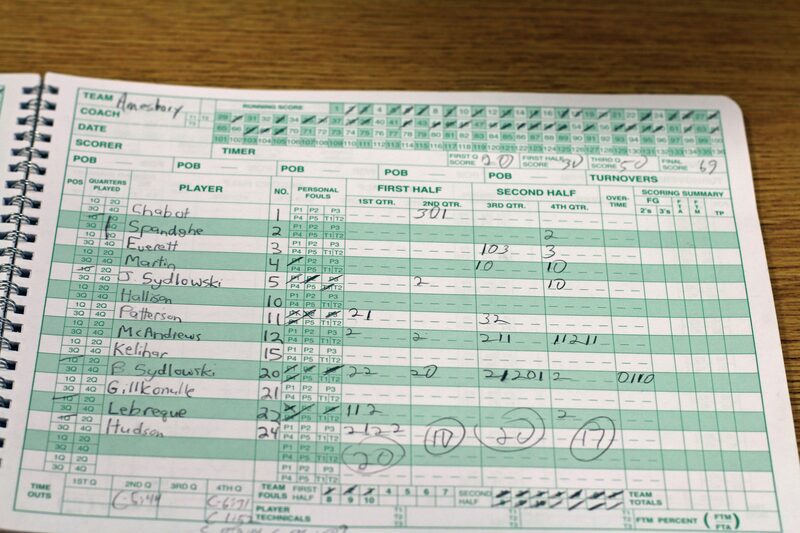 They were in the 30’s again in turnovers and still could have won this game. 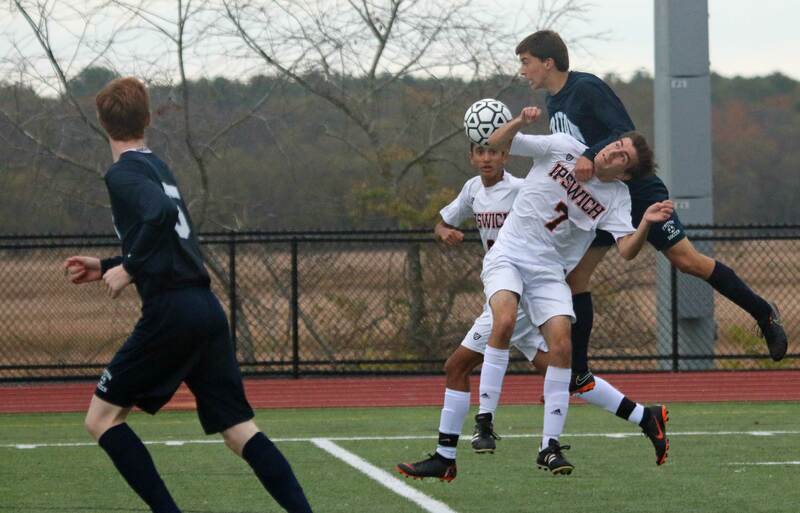 The pass attempt after an Ipswich double-team seemed to be the one that led to the most Amesbury miscues. 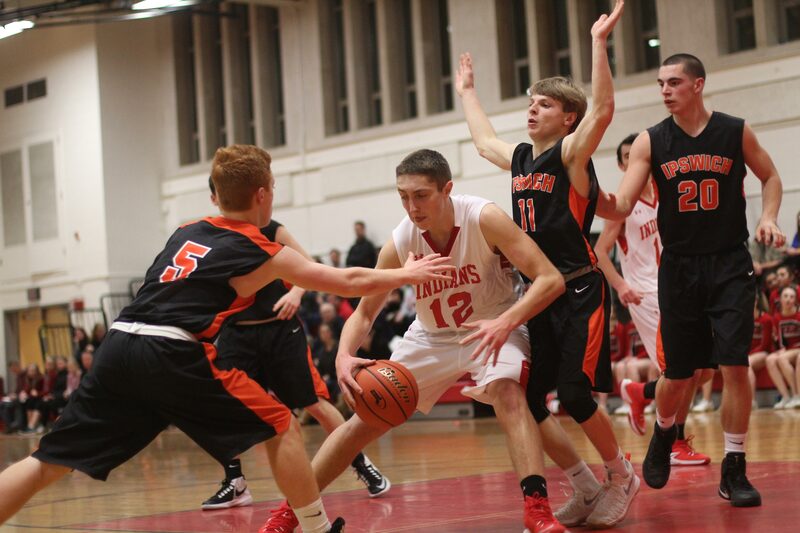 Amesbury shot their way into sizable leads in every quarter; 18-12 in the first, 26-16 in the second, 45-34 in the third, and 62-54 in the fourth. 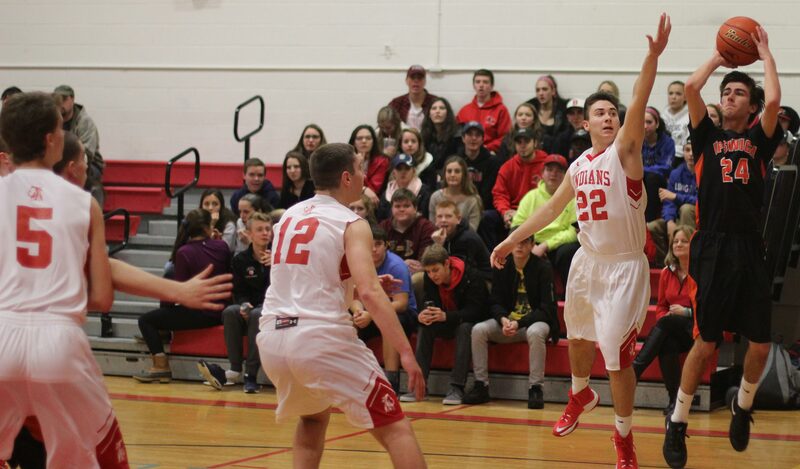 However, in every quarter the visitors would rally back, driven by their defense. 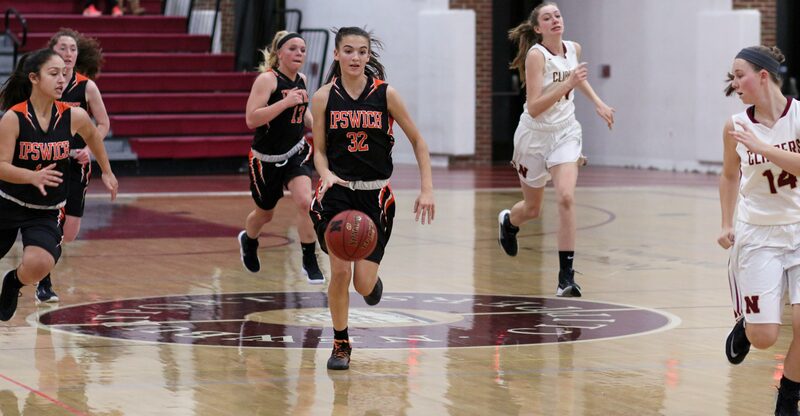 In the last quarter Ipswich actually rallied into a three-point lead with fifteen seconds left on a turn-two by Izzy Morrissey plus a free throw. 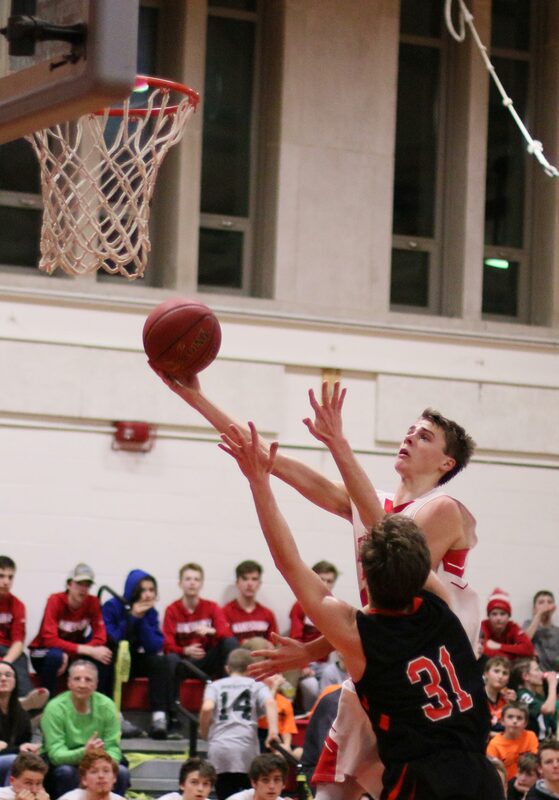 But Nick Everett had the answer as he drained a three of his own from in front of the Amesbury student section sending those folks into a frenzy and this one into overtime. 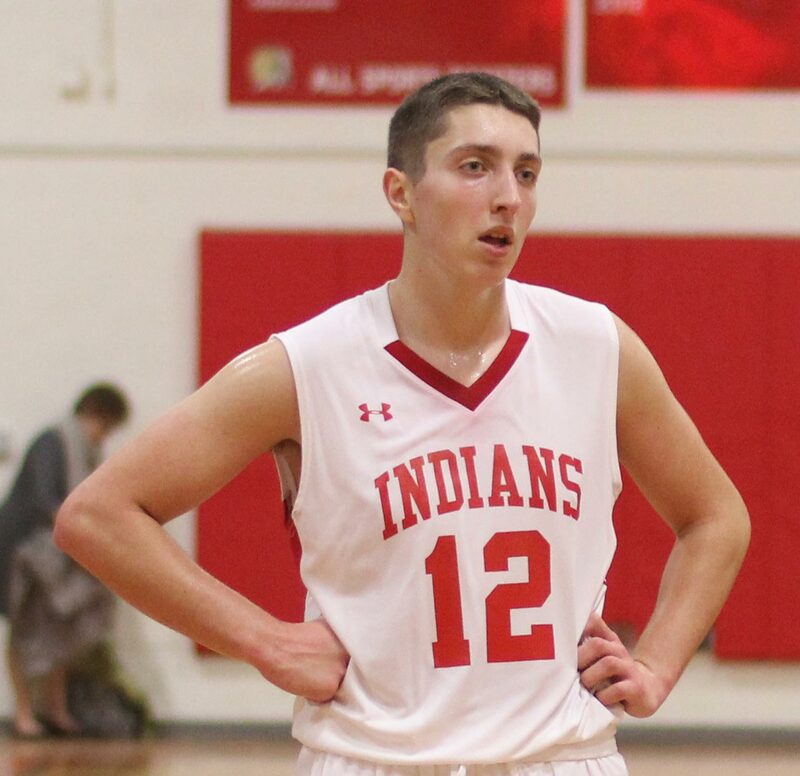 In overtime, Zach Long made two straight free throws and Billy Sydlowski answered with two free throws with 1:43 remaining. 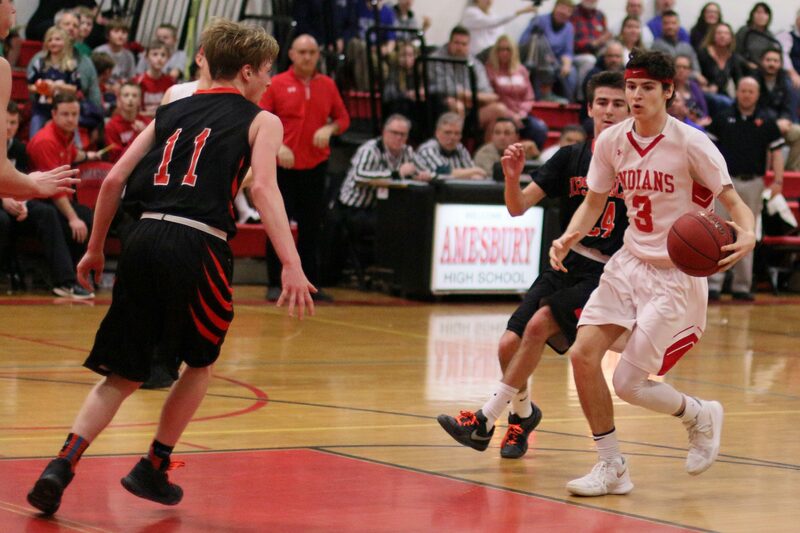 For Amesbury, there were three turnovers before Billy made two of his four free throws and there were two more miscues after the free throws. 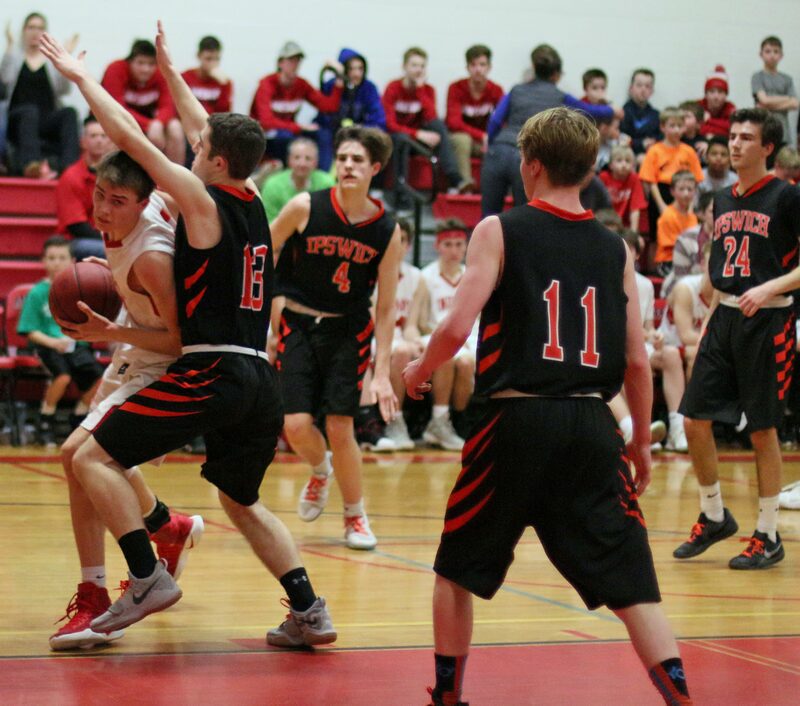 Those final two killed Amesbury’s comeback plans. 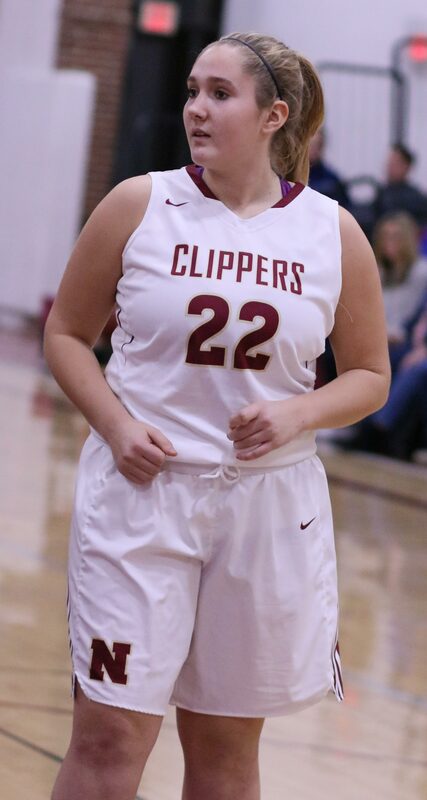 After the AHS free throws tied the game (69-69), Izzy Morrissey took a pass from Ben Yanakakis and hit what turned out to be the game-winning three with 1:25 left. 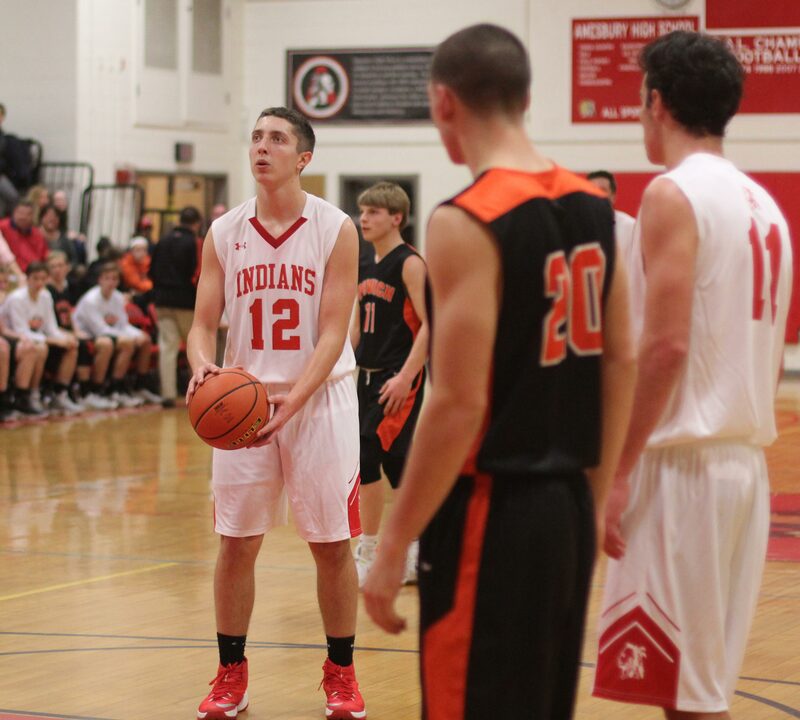 Jason Finkst’s two free throws with nine seconds left finished the scoring. 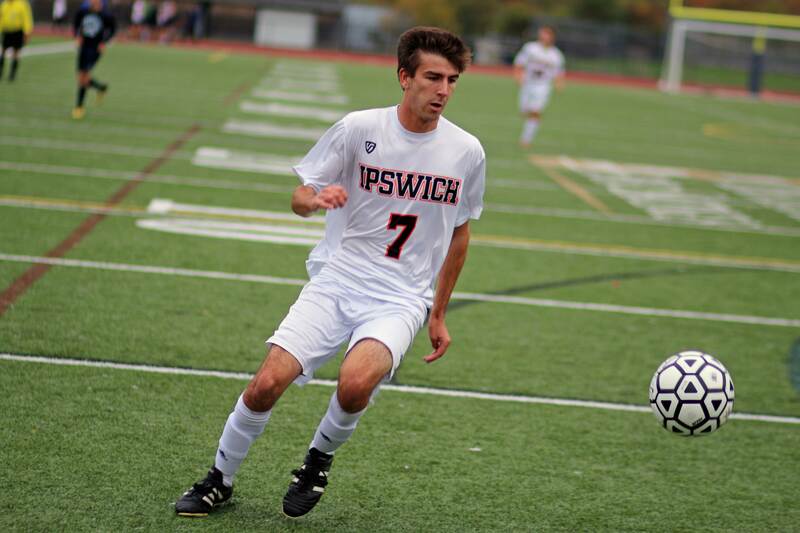 Zach Long (20), Ben Yanakakis (19), Izzy Morrissey (10), and Jason Finkst (12) led the Ipswich scorers. 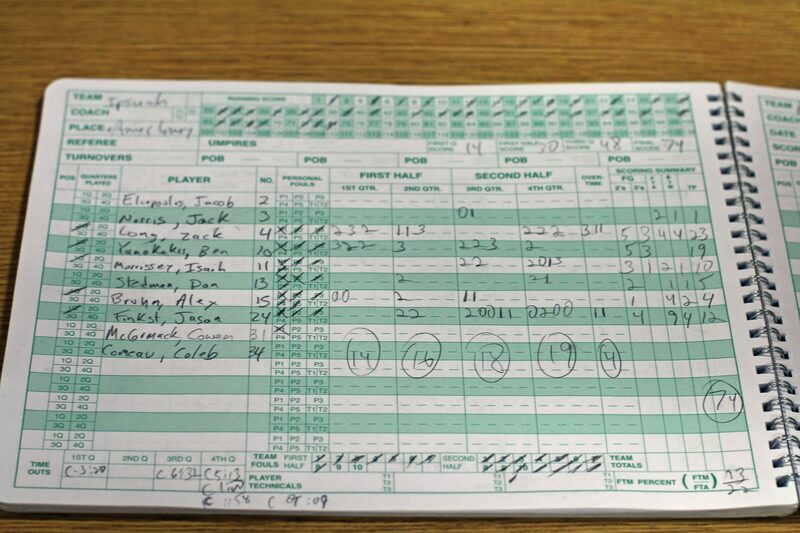 AHS coach Tom Comeau gave minutes to everyone on his team and ten of them scored points. 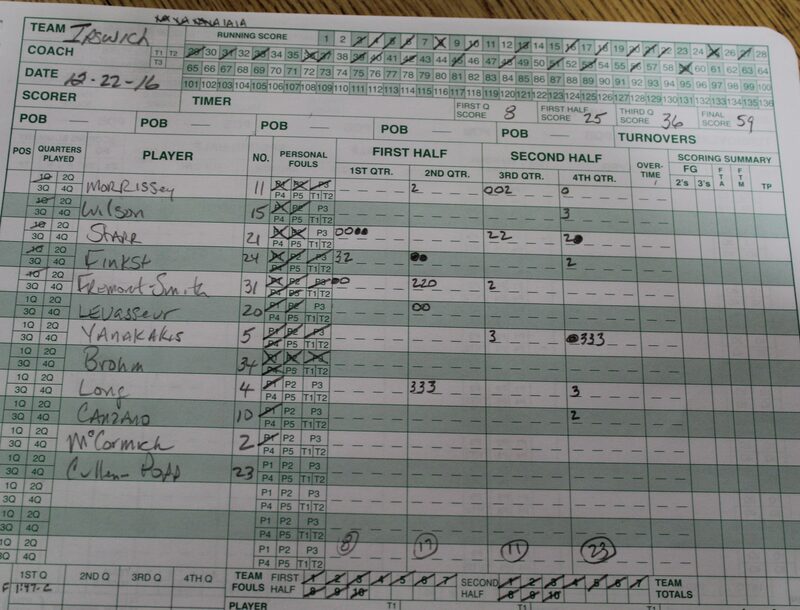 Billy Sydlowski (16), and Thomas McAndrews (14) led the scorers. 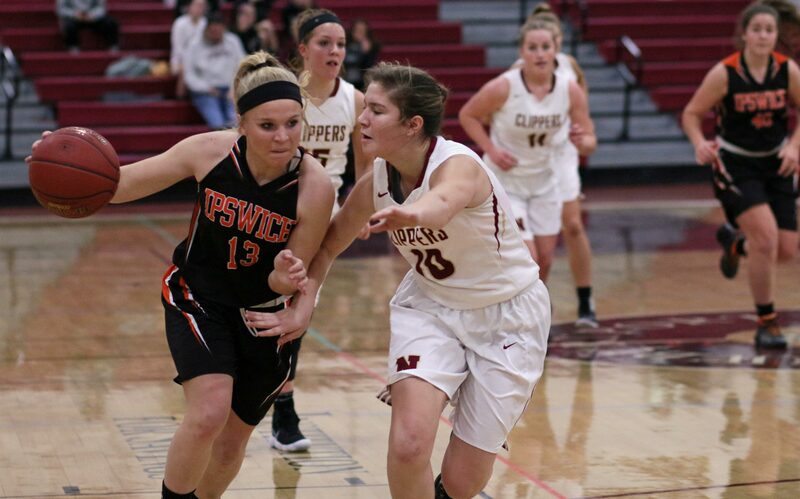 On January 5th Amesbury won at Ipswich (75-63) as they had four players reach double figures. Ipswich had lost three straight games prior to tonight’s win. 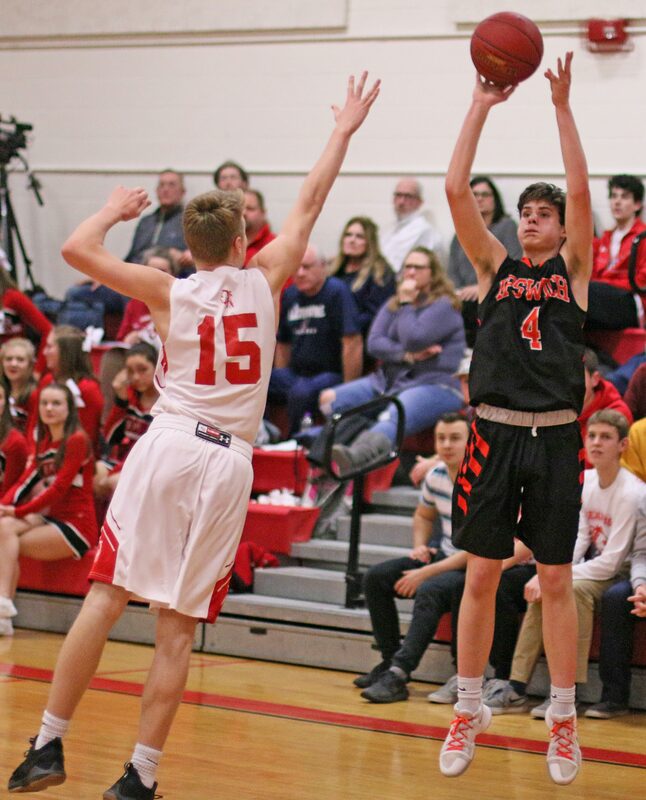 Dan Stedman turned a teammate’s missed free throw into an old-fashioned 3-point play as part the Tigers comeback in the 4th quarter. 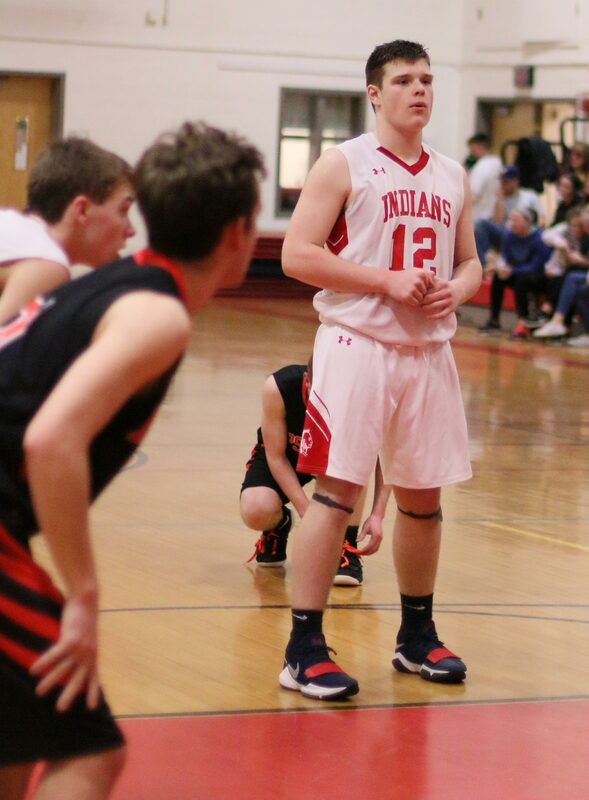 Freshman Thomas McAndrews looks like a player with a bright future with Amesbury. 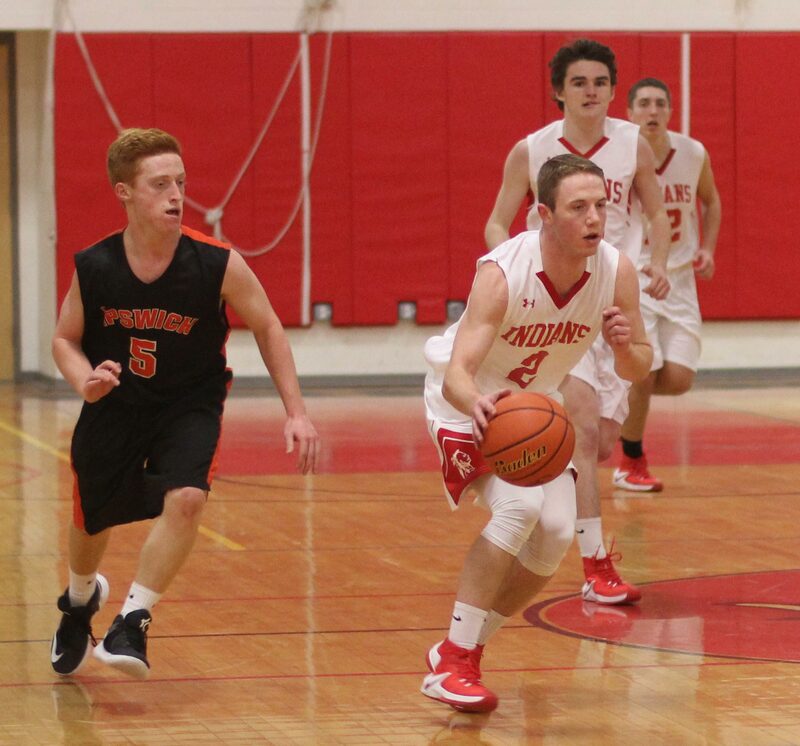 He made all six free throw attempts and had a high degree of success dribbling the ball and passing the ball against the Ipswich defense. 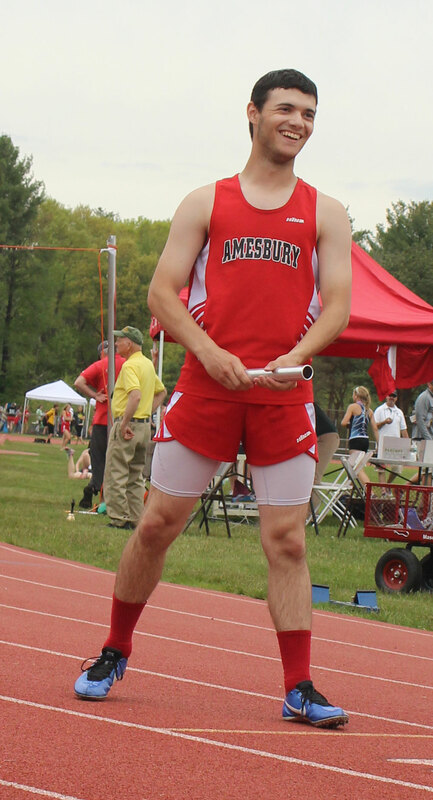 Amesbury’s Zack Levarity (2) gets the signal that he has scored at touchdown. 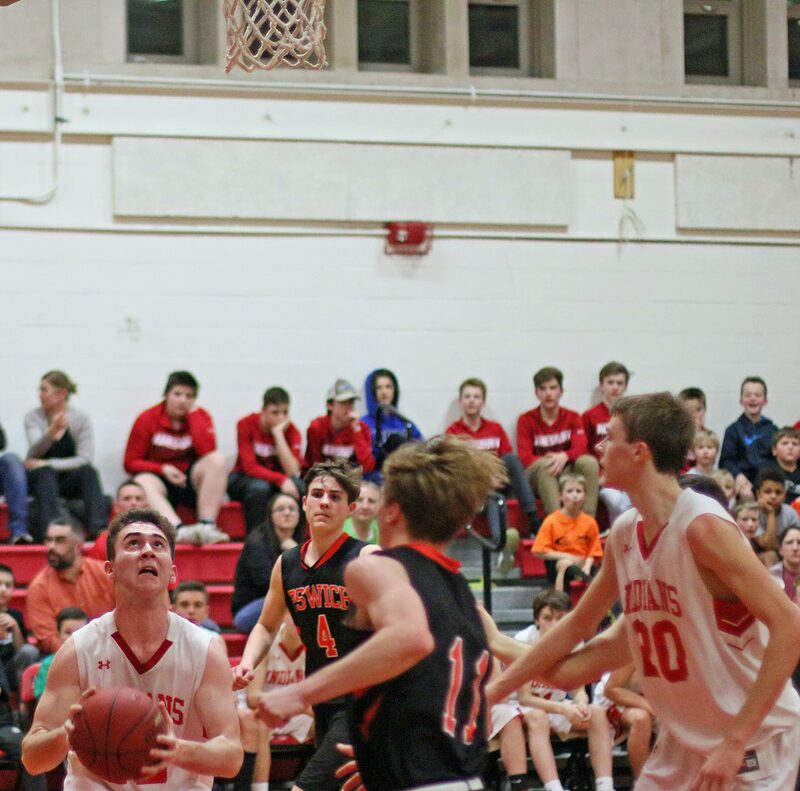 (Amesbury MA) Giving up 30+ points per game won’t win many of them and that logic held true for Amesbury Friday night as they fell, 42-21, to Ipswich at Landry Stadium. 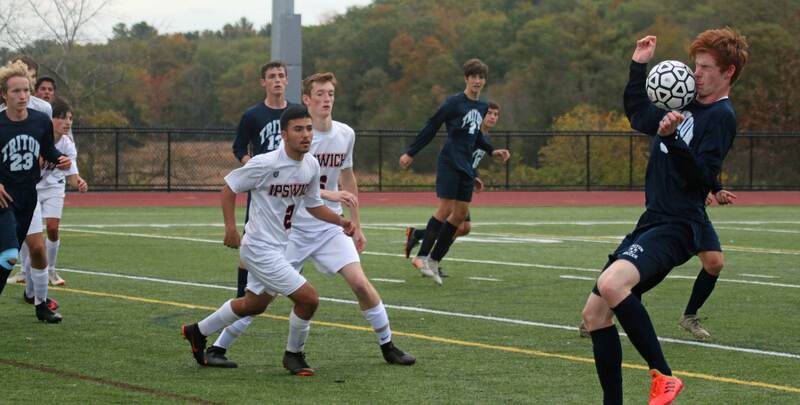 Amesbury (0-5) was in a tie with the Tigers (3-2) in the second period, 14-all, but stayed quiet thereafter offensively until a last-minute tally versus the Ipswich reserves. 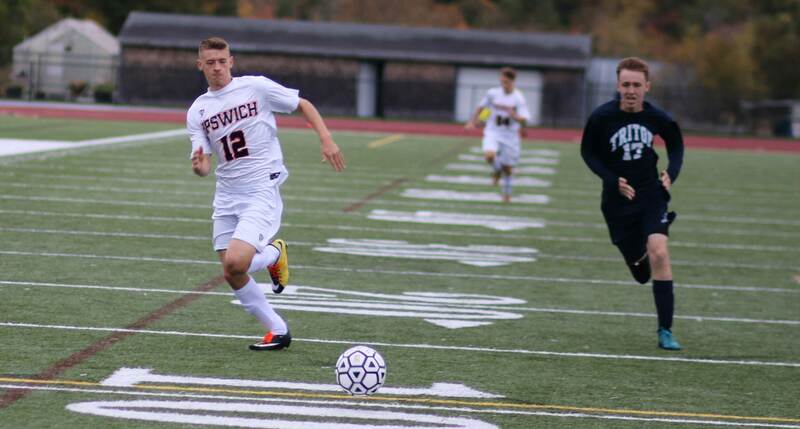 Two rushes into the game Ipswich was on the board with sophomore Justin Moran in the Amesbury end zone. 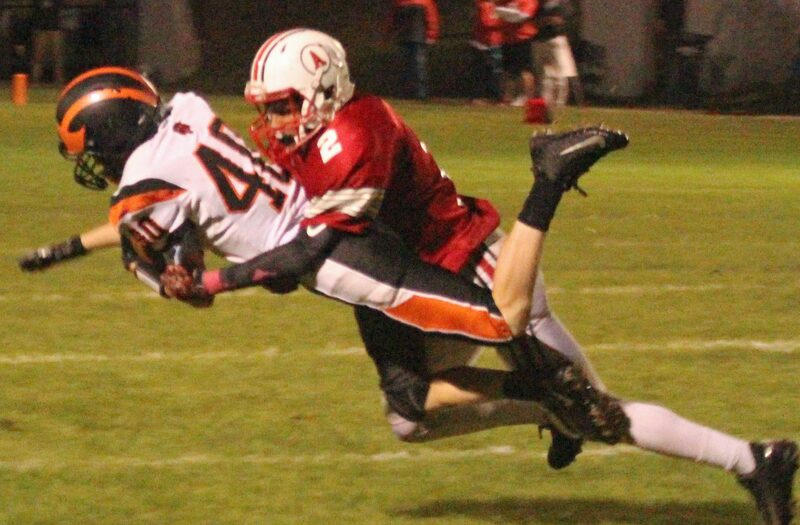 It looked to me as if the same play was used to get Justin to the Amesbury 25 and later in for the score. Justin Moran (5) off to an early Ipswich touchdown. The ease of the Ipswich touchdown had me thinking early on that the Amesbury defense was going to be severely tested……….and they were. I wondered if the Indians could generate enough offense to hang around in a high-scoring matchup. 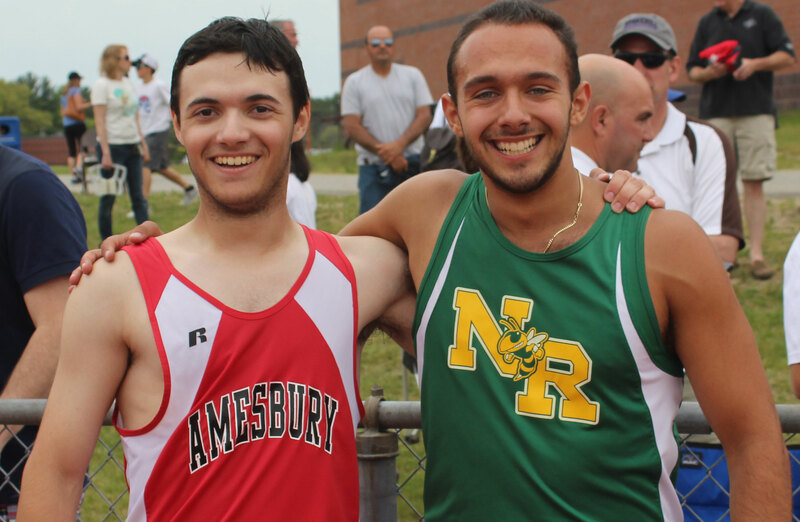 It turned out that Amesbury could put up points. 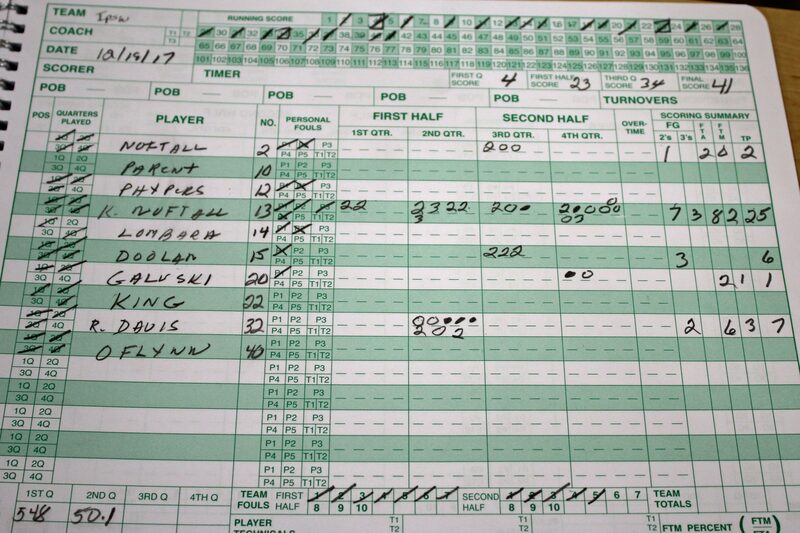 The home team answered the first two Tigers’ touchdowns with ones of their own. Junior Patrick Birmingham figured in both of them. 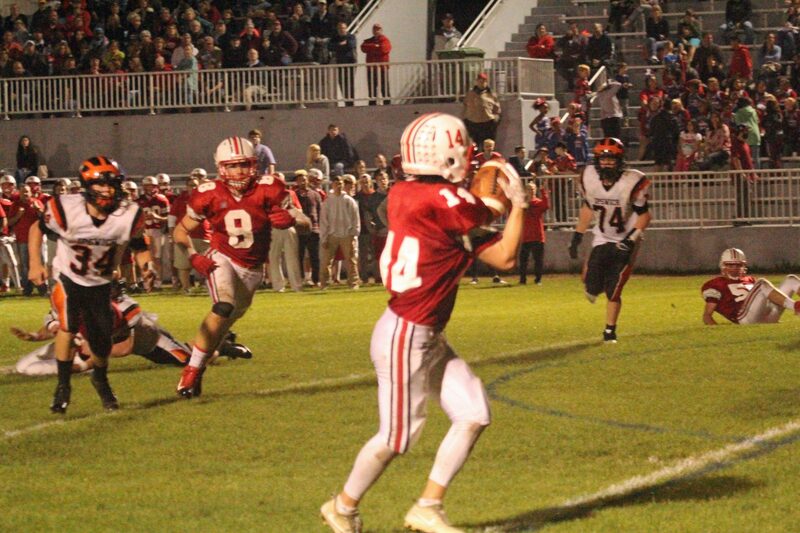 His 17-yard run in the first quarter put Amesbury on the Ipswich five where Zach Levarity scored from. In the second quarter, Patrick found daylight on the right and QB Blake Bennett tossed him a 13-yard catch-and-run tally. Patrick Birmingham hauls in a TD pass from Blake Bennett. 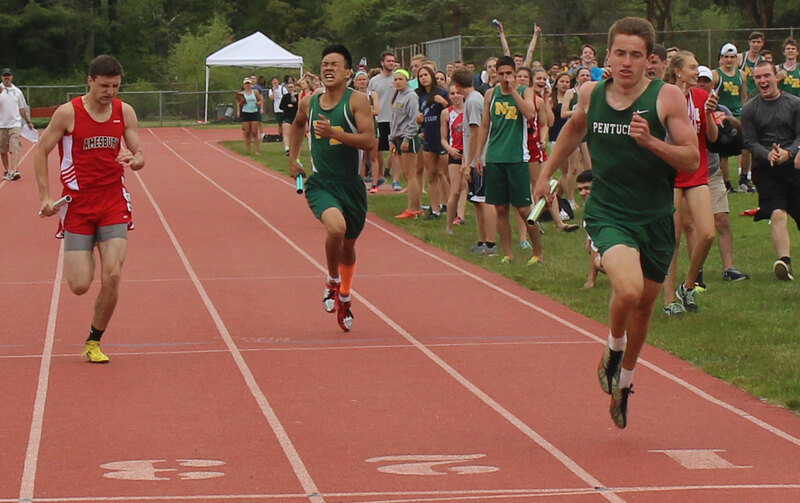 So Amesbury wasn’t going away. It was a matter of which team would be unable to answer first. 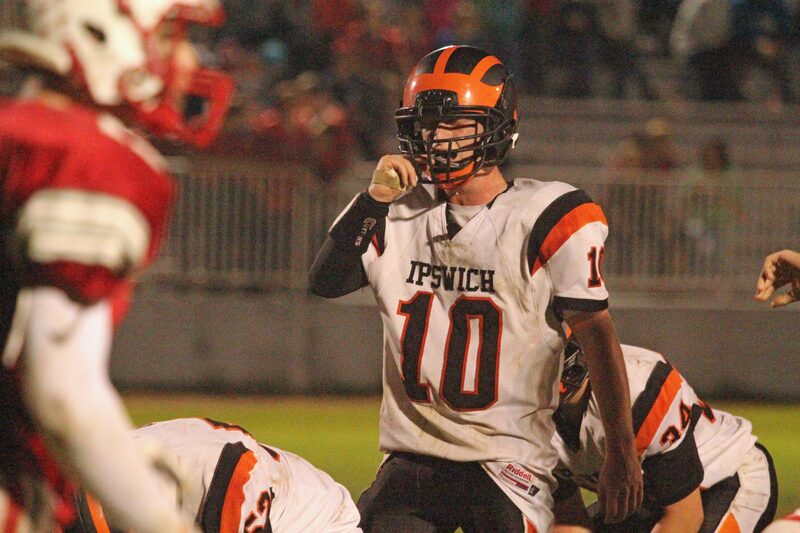 Ipswich responded to the tie score in the 2nd quarter with the second of Pat Gillis’ three TDs. I am not sure if Pat was even touched on any of his touchdowns. 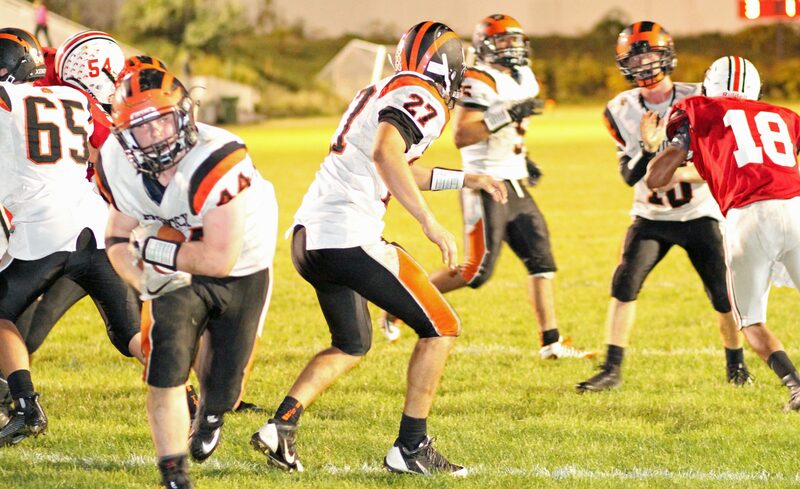 Good blocking and good deception within the Tigers offensive schemes created some serious openings in the Amesbury defense. 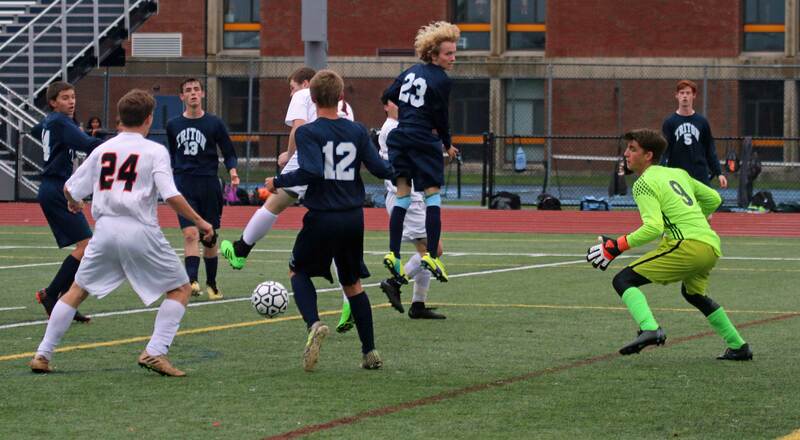 Amesbury didn’t get the score back in the first half but they received the kickoff in the 2nd half. 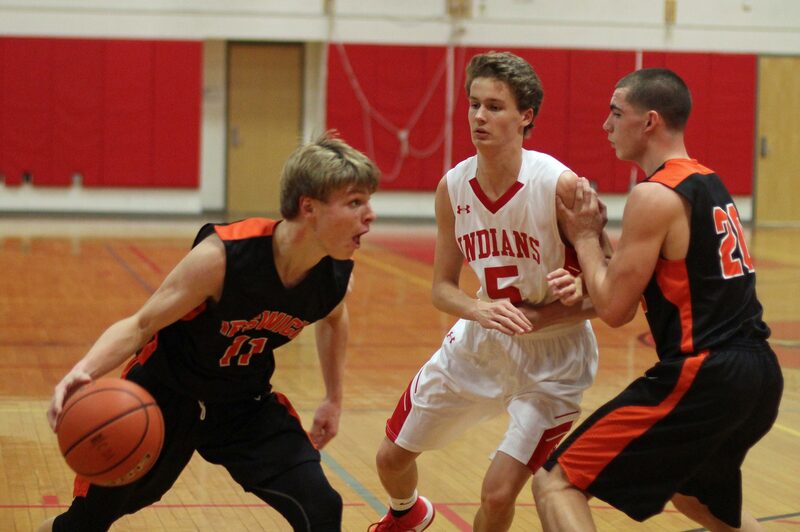 Something transformed the Ipswich defense in the second half. 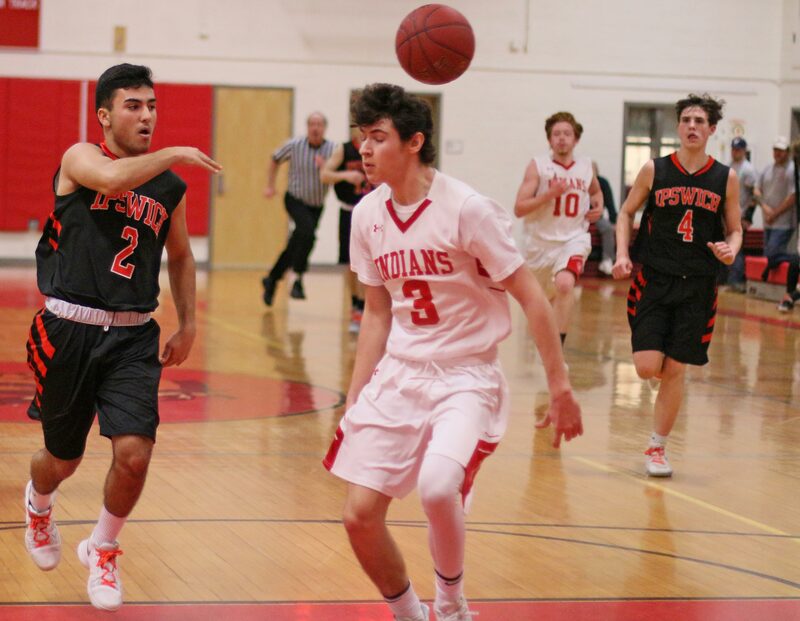 The Indians tried a variety of plays in that second half but seemed to be confronted with multiple tacklers much of the time and held to short gains. The Tigers gained two-TD separation in the third quarter. 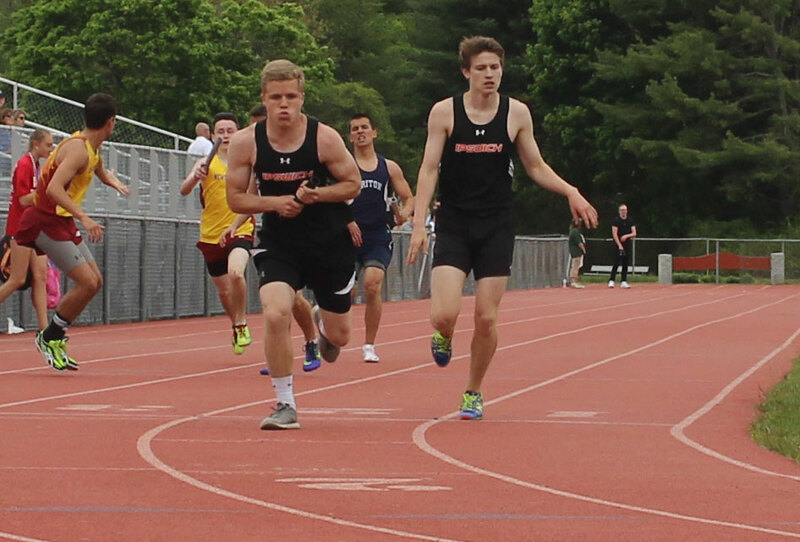 A pass from QB Ben Yanakakis to senior Alex Bruhm had Ipswich cooking at the Amesbury five. Pat Gillis finished in the end zone several plays later. You’re trailing by fourteen points late in the third quarter so you dust off the passing attack. 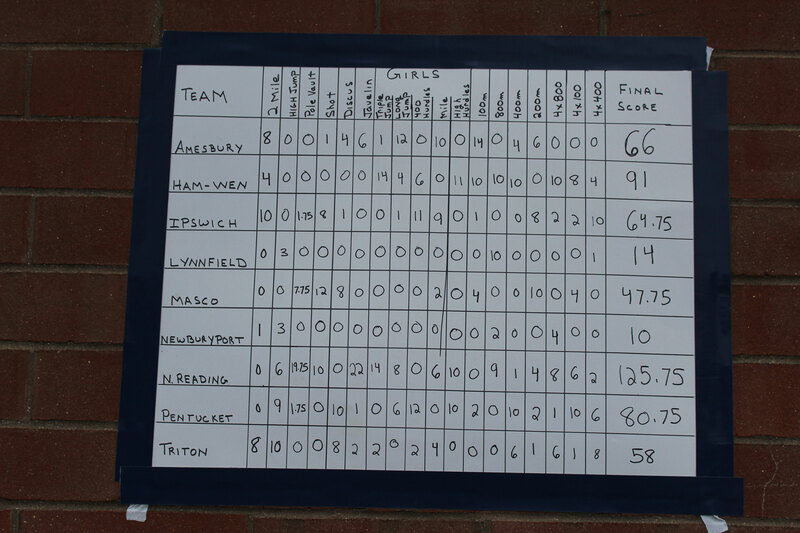 Amesbury went that route with absolutely disastrous results. 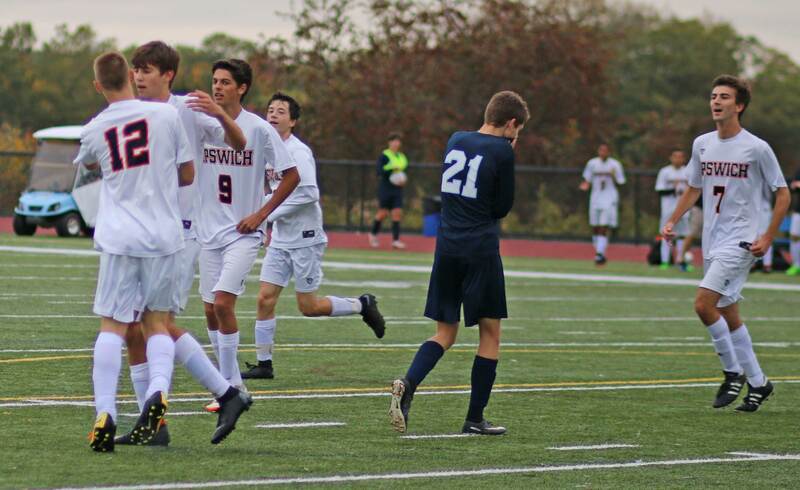 Two straight Amesbury series ended up in touchdowns……..for Ipswich. Interceptions. 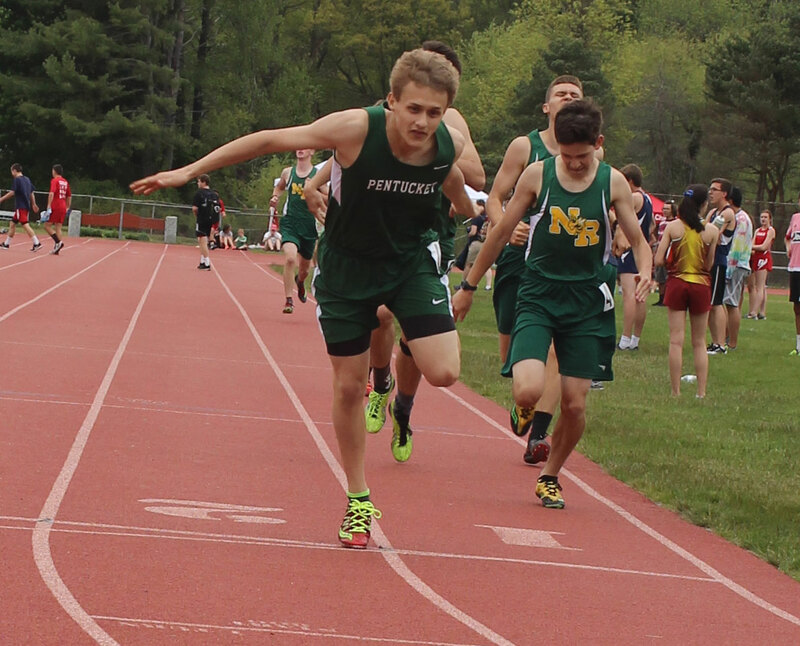 Trying to get credit straight in sports is an interest of mine. 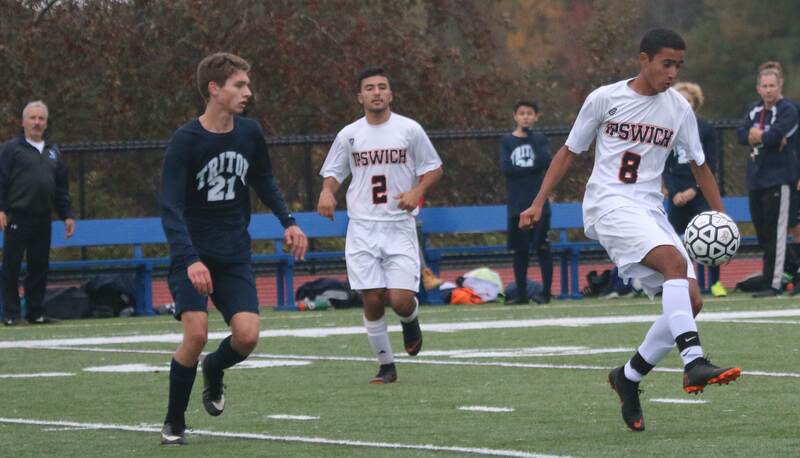 Christian Fabbri and Alex Bruhm ran back interceptions for touchdowns for Ipswich. I took enough pictures so that I could see contributors to those pick-six plays. 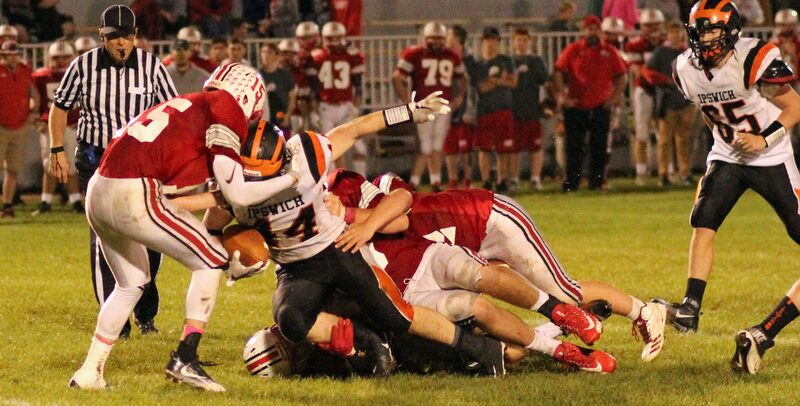 Pete Spinale was bringing AHS quarterback Blake Bennett down as he tossed the first interception. On the second one, Ben Yanakakis was in Blake’s face, certainly affecting Blake’s view downfield. Christian Fabbri has an interception and blocking to get him into the Amesbury end zone. 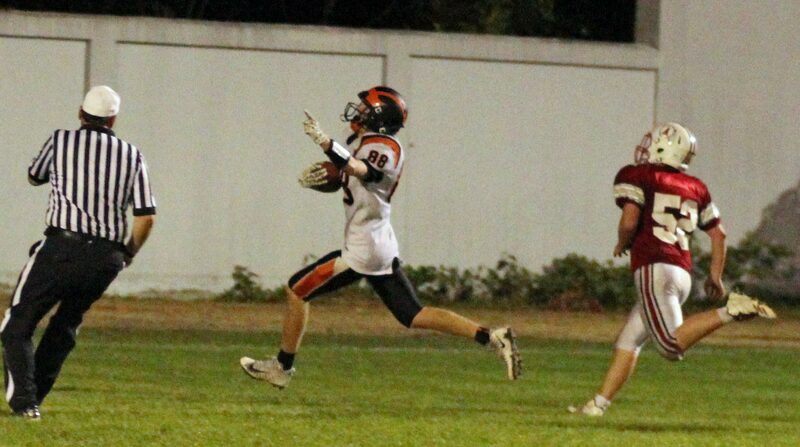 Alex Bruhm takes an interception to the Amesbury end zone with Jacob Hamel chasing. Needless to say, that revived IHS defense put fourteen straight points up for the visitors and put this game well out of reach. Nice crowd at Landry Stadium as the senior athletes and cheerleaders were recognized. Nice weather too. I’ll take low 60’s, without a breeze, anytime at night in early October. 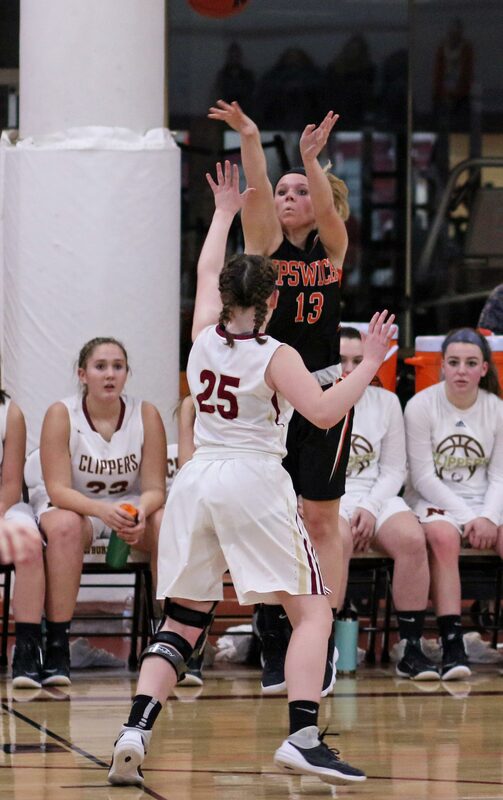 On one play in the second half, Ipswich had only ten players on defense and still held the Indians to a small gain. 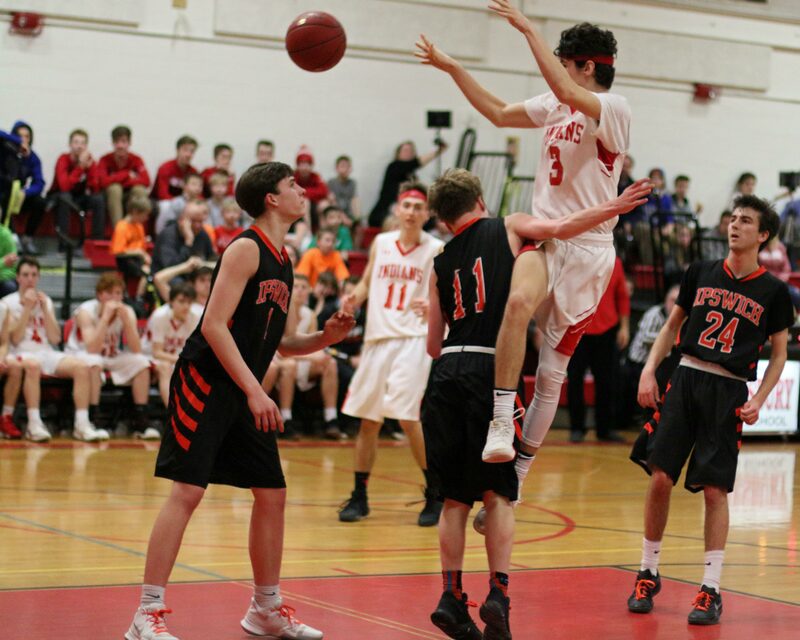 I was completely fooled by Amesbury when they went for the first of two their extra points. Why? 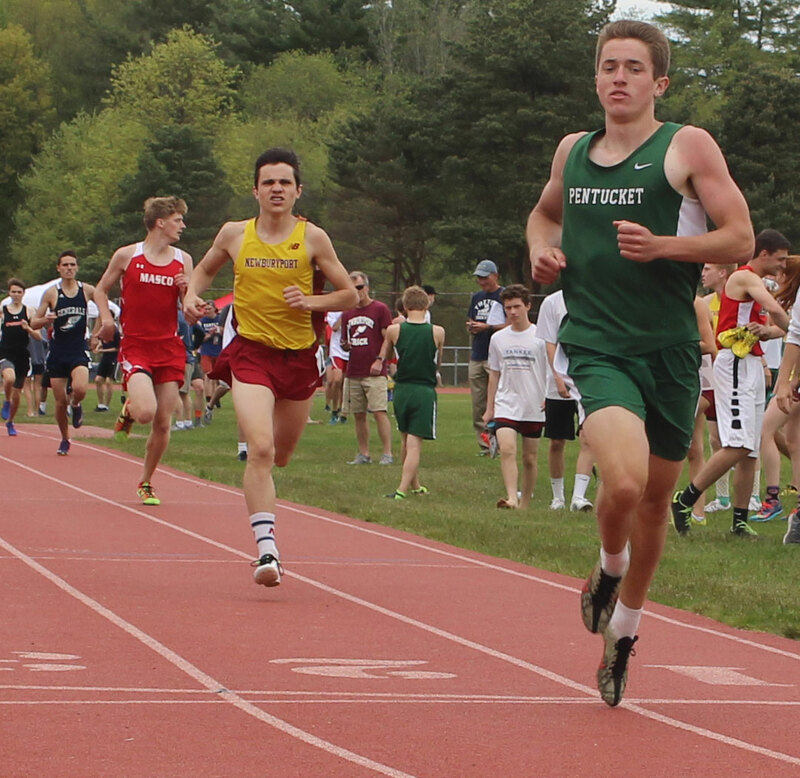 They had no holder just #90 (Ruairi Cleary) back there. I assumed a timeout was coming but instead the ball was snapped to Ruairi and he dropkicked it for the extra point. Didn’t Doug Flutie do that once for the Patriots? 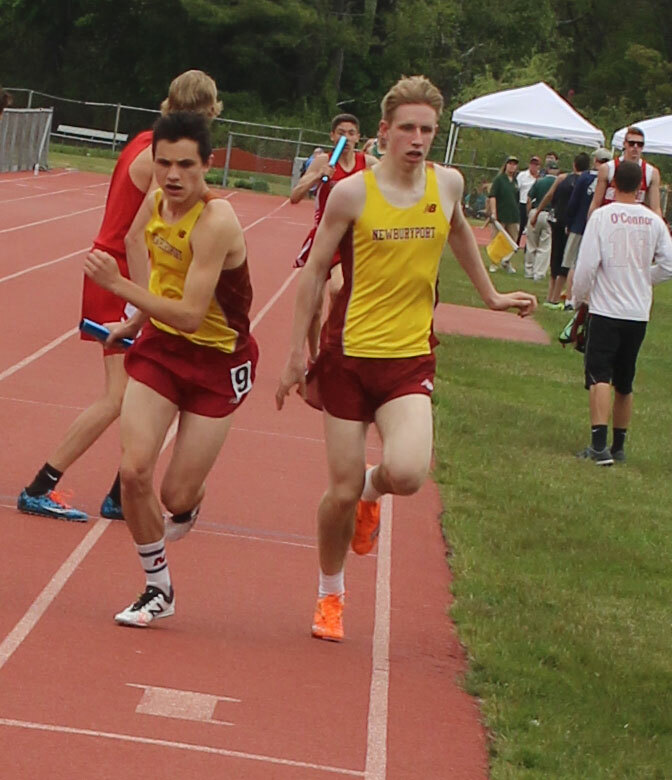 When the attempt for the second Ruairi extra-point attempt occurred I was camera ready and got a shot of the sophomore doing it. Plenty of helpful information from the public address announcer. 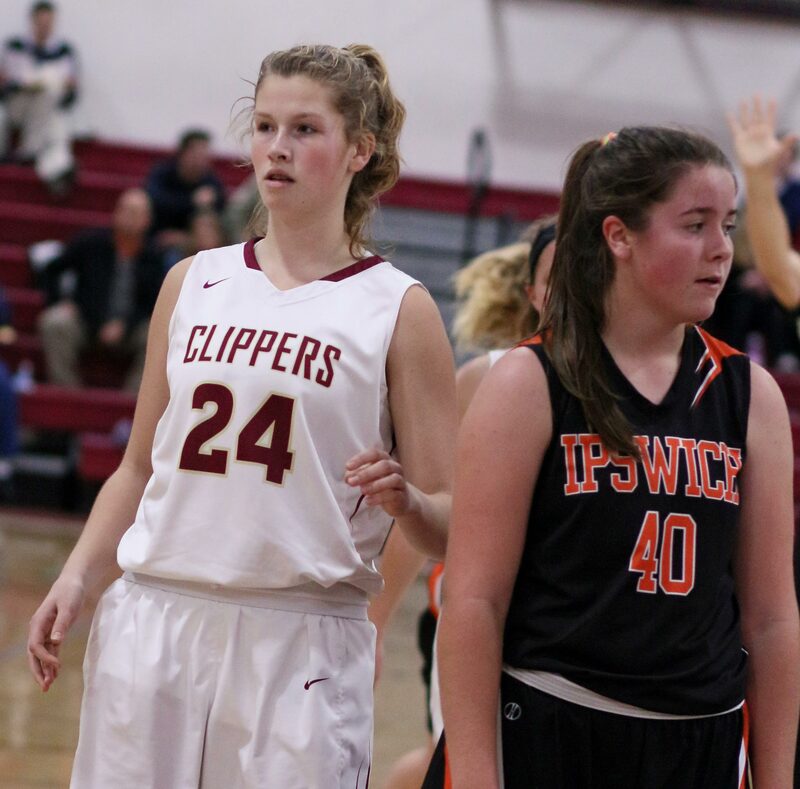 Ipswich had lost its other two road games to Newburyport and Triton. 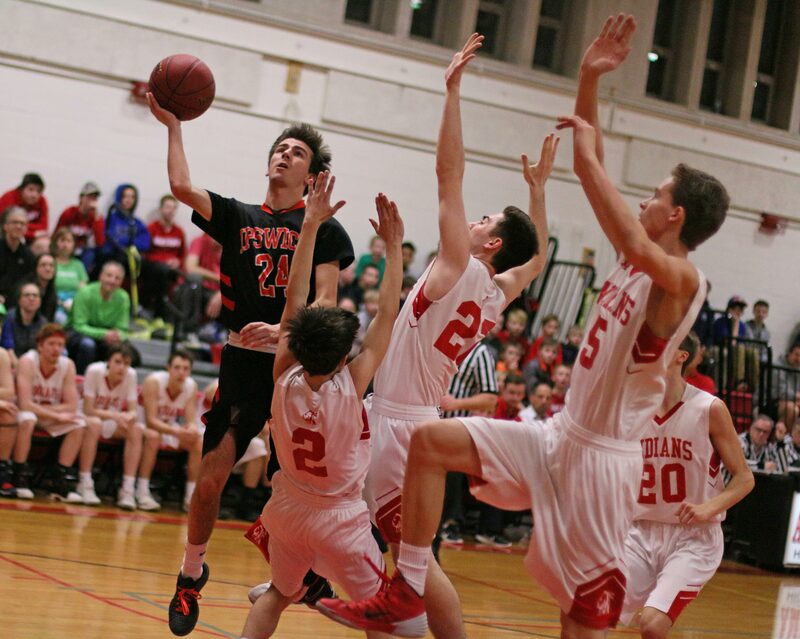 The Tigers have defeated Amesbury four straight times. 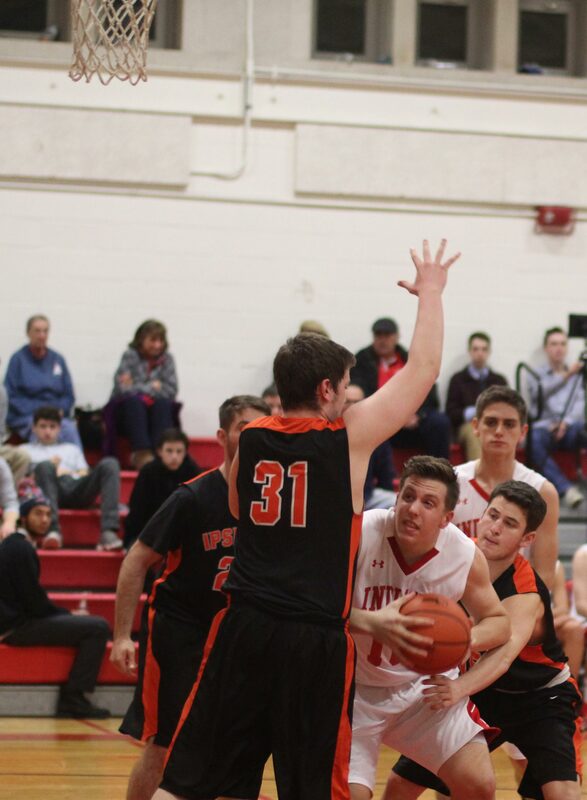 Ben Yanakakis stopped by Amesbury at the goal line. 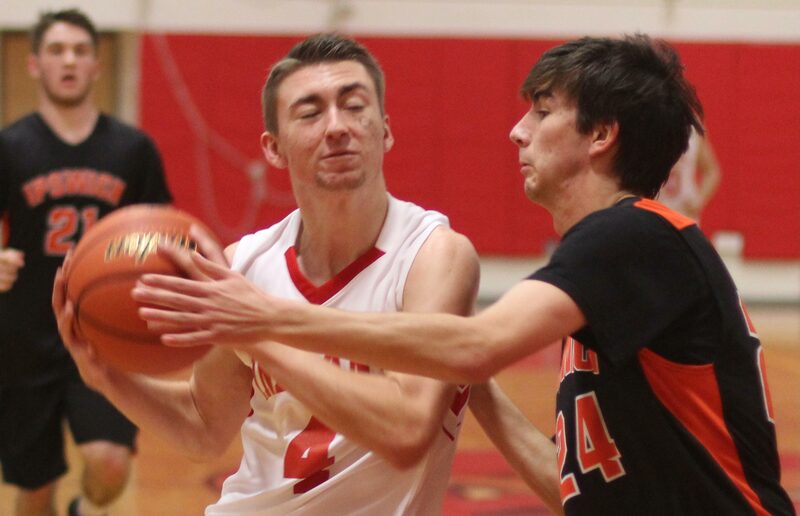 Ben Yanakakis pressures Amesbury QB Blake Bennett and an interception resulted. 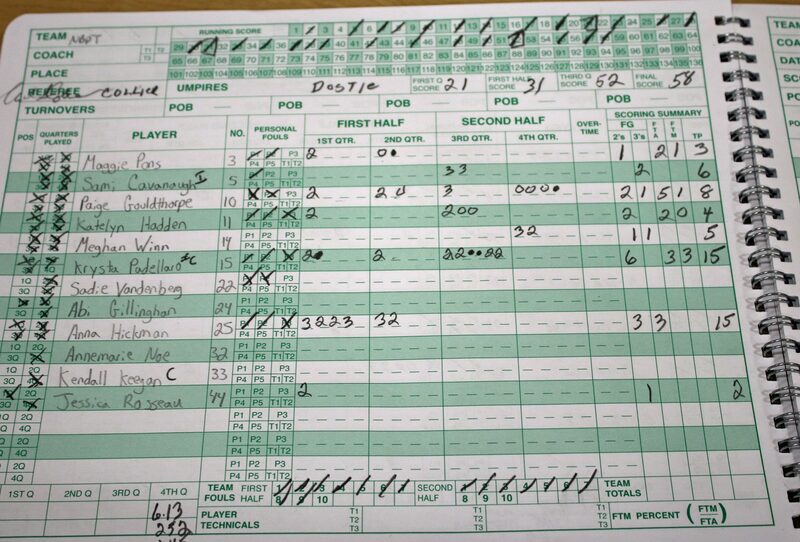 Caleb Comeau kicked five extra points. 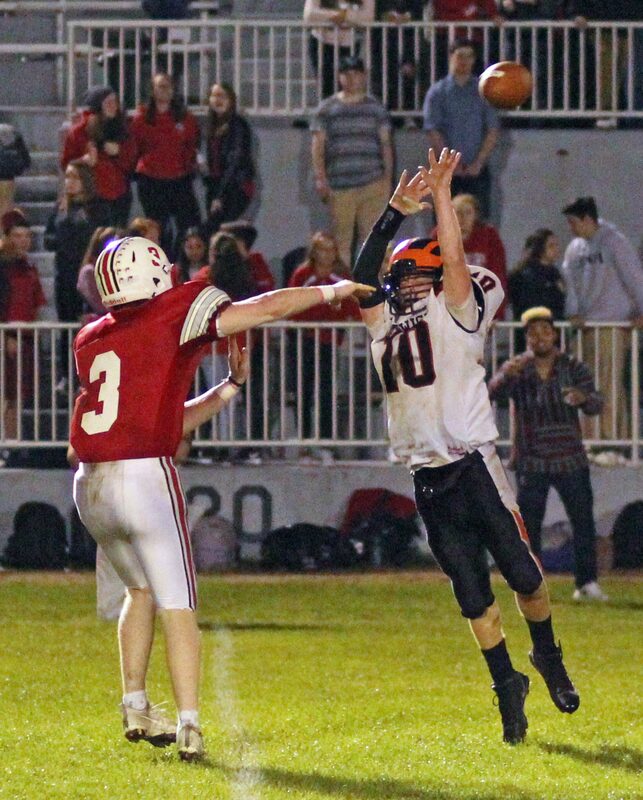 Pete Spinale pressures Amesbury QB Blake Bennett and it leads to an interception. 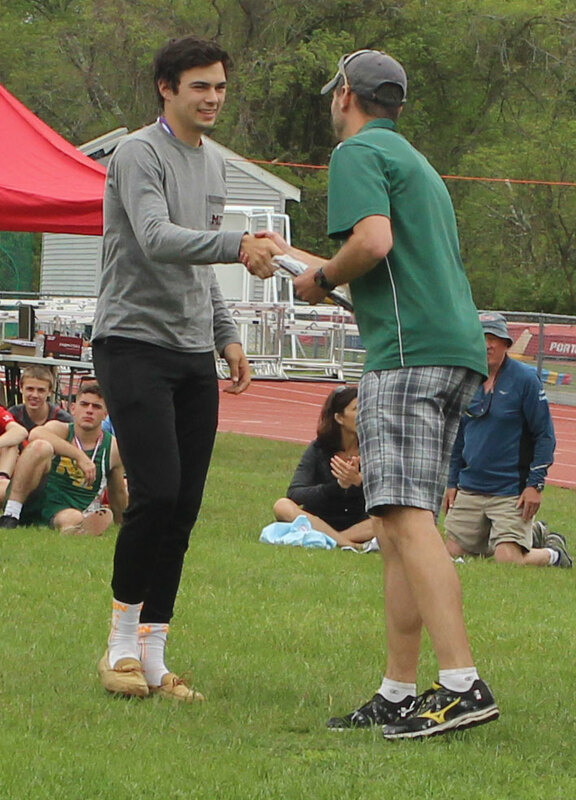 (Boxford MA) The team winners at the 2016 Cape Ann League outdoor championship track meet were the Amesbury boys and the North Reading girls on a cloudy Saturday afternoon at Masconomet. 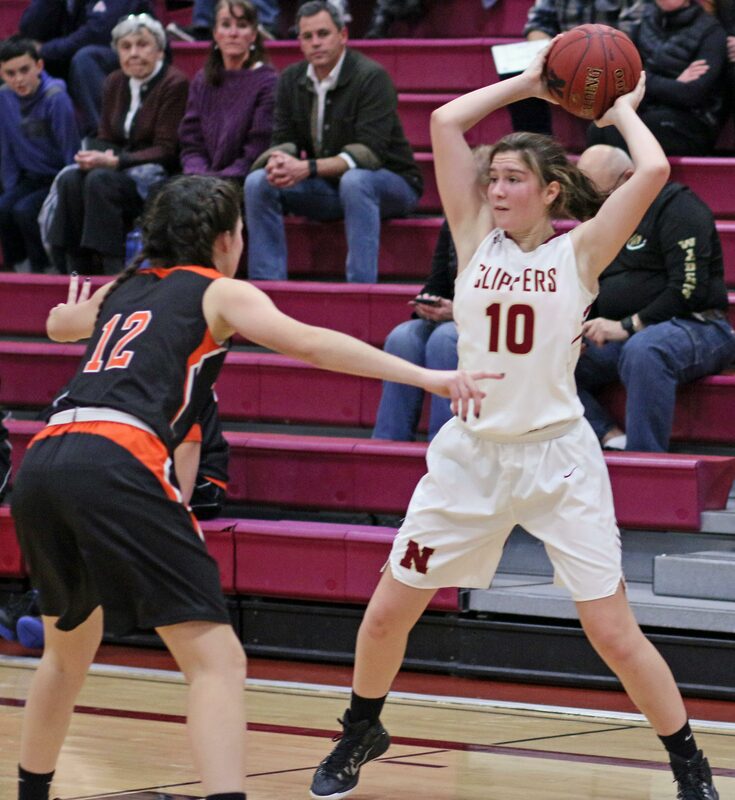 Amesbury held off second-place North Reading 113 to 100 while the NR girls had a 125.75 to 91 advantage over runner-up Hamilton-Wenham. 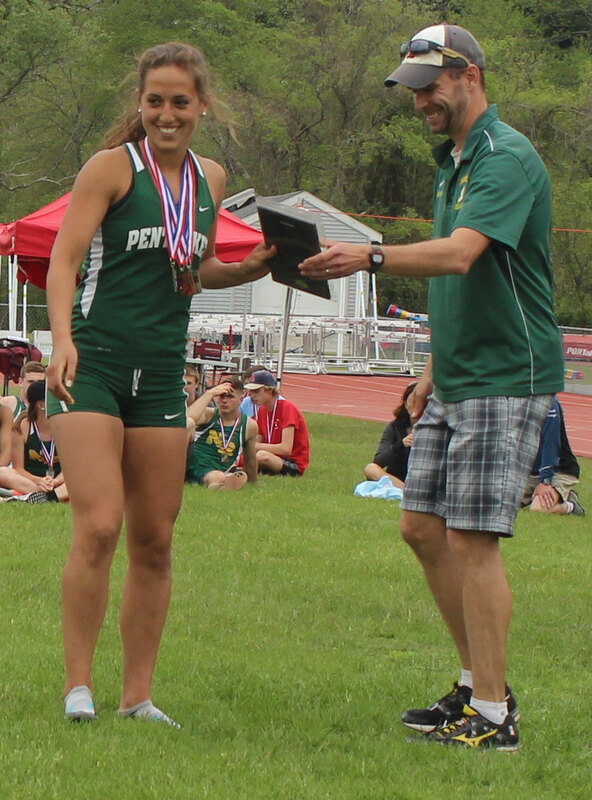 Newburyport’s Alec Reduker and Pentucket’s Carolyn Modlish were selected by the CAL coaches as the top performers at the meet. 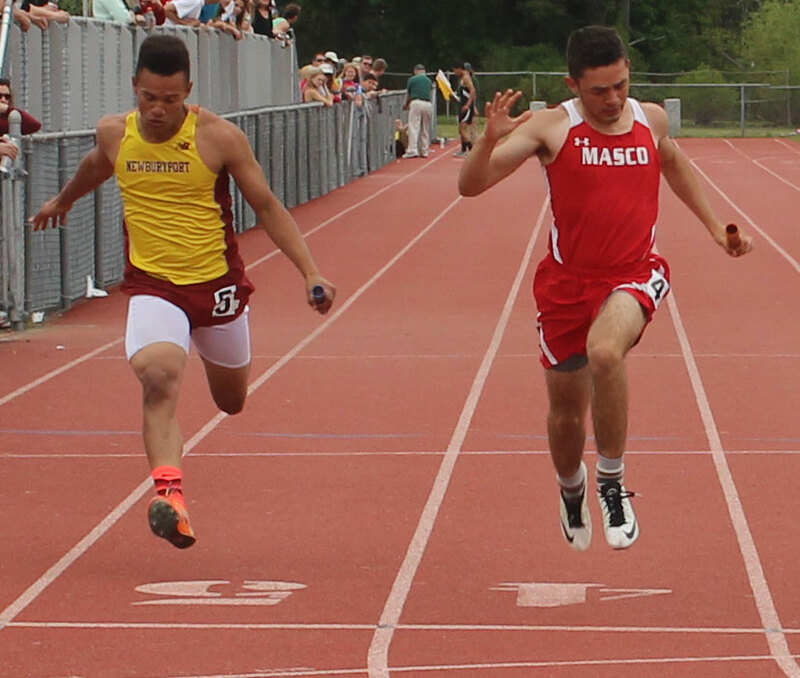 I was at Masco for the afternoon part of the event.